Ice Fishing Report January 31, 2014 Jeff Sundin - The Bark Was Worse Than The Bite - For my road trip to Minneapolis on Thursday. Listening to the weather reports on the radio, I was expecting to enter a national disaster area. But as I traveled through Remer, dry roads. Crossing the bridge at Roosevelt Lake, dry roads, blue skies and a ton of ice fishermen making me envious. Garrison, dry ... Rogers ... dry ... It wasn't until I was driving the last three or 4 miles that my tires ever touched any snow and then, it was barely enough to get my attention. No doubt, part of the reason for the great travel conditions was because the DOT and County snow plow operators do a fantastic job of getting rid of snow. But is many respects, I think it was a slow news day too and more than a few TV and radio personalities needed something to make a big deal about. For today, making the rounds in the metro area tops the bill for the moring. But I'll be back on the beat to drum up fresh reports this afternoon. If you're headed for the lake, Good Luck! (1/31) From the Lake Winnibigoshish Region, Nik Dimich says; "Winnie Walleyes lately have had a tendency to bite on a certain hump one evening and then move to another piece of structure the next. The reason is they’re chasing minnows and small perch. To counteractive this dilemma, work shorelines and mid-lake break-line structures from 22-26 FOW during the first hour of the morning and last light/early dark in the evening. These are your best times for walleyes. On another note, perch fishing has been good ... " ... Read >> Lake Winnie Region Fishing Report . (1/31) On Bowstring Lake, Jeff Sundin; "Knowing that drifted snow and fishing pressure would stack the odds against fishing the same territory we visited last week, I and my fishing partners, Zach Dagel and Roy Girtz decided to do some exploring. Traveling together, using two trucks equipped with full gas tanks and plenty of tow straps Zach was confident that we could move around the lake. Using the road out of Trails End Resort as a starting point, we traveled it to the end and then busted some snow drifts to head across the ice into fresh territory. Traveling by truck wasn't too bad, there are some drifts that bogged down the 4X4 from time to time, but never enough to stop the lead truck. Roy, driving behind us said that it was easy travel once the path had been established. Ice thickness is over 20 inches now and on Wednesday, we did not find any evidence of slush except in the areas immediately adjacent to our drilled holes. I don't think that I would suggest going solo while driving around the lake. But if you are in a position to tag team, it looks like you'll be in good shape, at least as long as we don't get another heavy snowfall. After checking out 4 potential fishing holes, our track record was 50/50. We found fish in two areas, but in the other two, we stared at blank screens. The highlight of our trip came when we spotted a small inside corner along an edge where deep water met a shallower, soft bottom flat. The depth where we drilled ranged from 20 feet, down to 28 feet. None of the shallowest or the deepest holes produced fish. But the holes that ranged in depth from 23 to 25 feet did have some fish under them. Not a gigantic school of fish, but enough to produce some action. During a short window at mid-morning, this small school of fish was very active and struck aggressively. The problem was that once they shut down, they really shut down. For several hours, it didn't matter where we went or what we did, we had lookers, but no takers. Strong winds and busy schedules encouraged all of us to leave the lake before twilight, so we don't know for sure if there was an evening bite, but my guess is that there was. For access to Bowstring and a helping hand with getting started, Bill and Erin at Trails End Resort will take great care of you!" (1/31) Ryan Peterson checked in from Lake Winnibigoshish and said; "Anglers should be optimistic for the upcoming weekend. Travel conditions have improved dramatically on Lake Winnie and there shouldn't be any problem accessing the lake. Working along with Denny's Resort, Ryan has a road system that is expanding daily. They now have roads leading to Little Musky Bar as well as both Big and Little Islands. There is also an additional 1-1/2 mile of road leading North along the east shore". Good luck and be safe! - Ryan Peterson's Guiding . (1/31) Finding Walleyes on Lake Winnibigoshish was the mission for the season finale' of Fish Ed. Host Jon Thelen snuck onto the big lake to bag some Walleyes and discovered that there's more to Lake Winnie than just a healthy Walleye population. 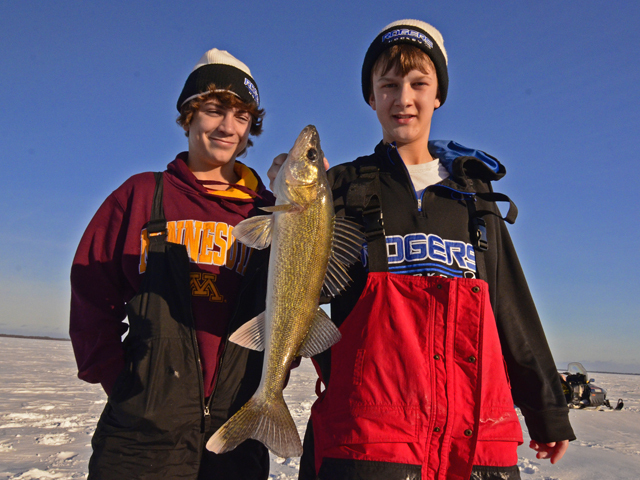 Click to view >> Lake Winnibigoshish Walleyes . Ice Fishing Report January 29, 2014 Jeff Sundin - The Nice Thing About Having My Own Website - Is that I can use it to say; "Happy Birthday Mom! I AM TOLD, that you've been doing a great job of raising me, at least so far .... :)!! (1/29) Giant Northern Pike - Are near and dear to my heart! I'm not alone either, you'd be surprised at how many folks love Pike, if they're big ones. I've trucked all over the countryside trying to help loved ones bag a trophy Pike and I'm sure that we'll be doing more of it too. The truth is, it used to be a lot easier to catch a monster Pike than it is these days and that's what spurs the debate; How are gonna fix that? An article released this week by Anglers For Habitat's Vern Wagner and Jim Lillenthal, calls for dramatic changes in Minnesota's Pike management practices. Their article; "Hammerhandles - Stocked Walleye Lakes at peril" focuses on statistics and suggests that the states gigantic populations of small Pike are hurthing Walleye populations. Doug Smith, Minneapolis Star Tribune says so too and his article; "Legislative Intervention Has Tipped Fish Balance In Scores of Lakes". Points the finger at the state, saying that anglers have been allowed to harvest too many large Pike. Both articles are likely to cause some fireworks, but they both raise valid points. If we want to see a rebound in the quality of Minnesota's Northern Pike fishing, we are definitely gonna need to switch gears from what we're doing now. An article that I wrote several years ago; "Northern Pike, The Quest For Quality", focuses on why we have stunted Pike in many lakes in the first place and what, if anything we can do about it. The one common thread among all of these pieces is that if we plan to see any improvement, we're gonna need to keep some smaller fish and release more large ones. That's what the lakes need, big Pike. A healty population of large fish will do most of the work for us, if we let it happen. Read all three and let me know what you think. I'll make it easy for you to comment by throwing a thread into the Fishing Reports Minnesota Page on Facebook . Ice Fishing Report January 28, 2014 Jeff Sundin - How? It's Easy, Ya Just Follow Good Advice! - Sometimes figuring out where to go and what to do can seem a little bit mind boggling. Luckily, it doesn't have to be, especially not if you remember where to look. Fishermen, by nature, tend to be a little bit territorial and reluctant to share good fishing information. But while some of them are busy pi..ing on trees and howling at the moon, they lose sight of the fact that we all need each other. If we don't help folks find fish and then help get them hooked up with the right stuff to catch 'em, then how can we expect to enjoy a healthy, vibrant, fishing economy? Luckily, there are people who want you to do well, who are eager for you to pay us a visit and who want you to be successful. We KNOW that if you are, WE WILL BE too. Now maybe you're not gonna get it all spelled out, you might not have the precise GPS coordinates. You might not even the exact name of a certain lake, but you're getting something even better. Solid information about how to do your own thinking and how to find your own place along the path. So without further adieu, take my advice and listen to some good advice. Right Here! 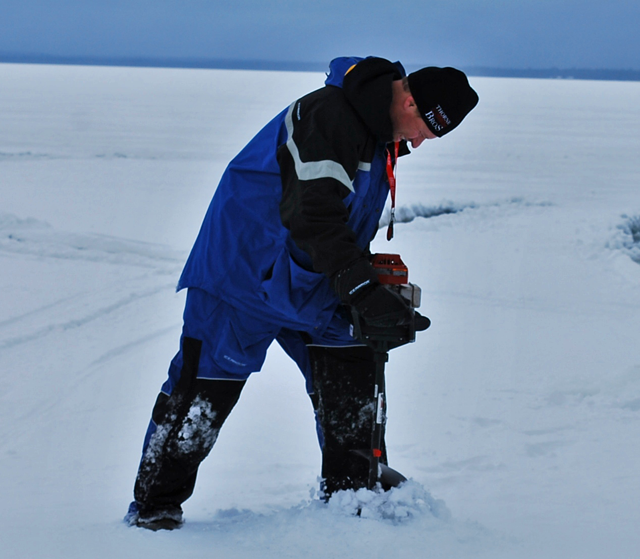 (1/28) From the Grand Rapids Region, Nik Dimich says; "On Pokegama Lake and other Grand Rapids area lakes travel across the ice sheet is near perfect, but the most efficient way is still by snowmobile and ATVs/UTVs that are “chained up” or equipped with a track system. For the safest vehicle travel on the big lakes like Winnie or Bowstring go to the resorts and use their plowed roads. This is still the best way access the lake and get off safely. On Pokegama, walleye fishing has been a hit and miss proposition, with evenings and early morning more productive than the others. The last hour of the sunlight as the sun sinks behind the tree line is still the best and, producing keepers, but the opportunity for trophy walleye or northern pike is ever-present. Look for panfish on mid-sized ... " ... Read >> Lake Winnie Region Fishing Report . (1/28) On Lake of the Woods, Border View Lodge, Mike Kinsella wrote; "There has been mixed success this week. It appears the weather has made a difference to anglers. Dealing with the wind and snow has also been an issue the past week. There have been a couple of white out days. There are still many fish in the slot being caught along with many little ones. Nothing has been reported to be the hot bait for the week. The standard gold and glow colors have continued to be the staple. The forecast ahead shows temps to be more stable this week. Temps are forecasted to be just below zero most of the week. - FISH ON!" 1-800-776-3474 Border View Lodge . 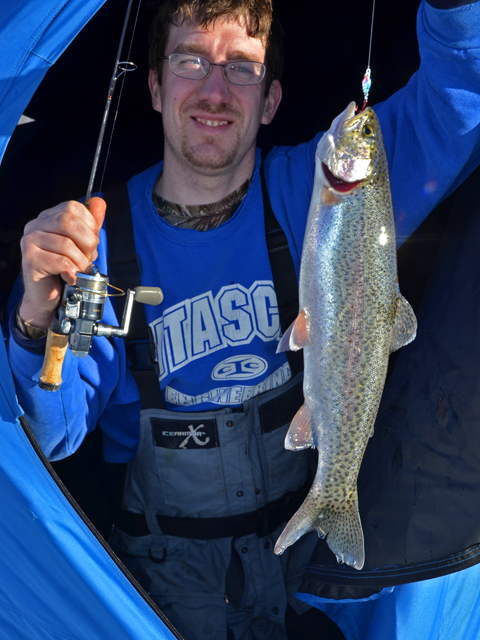 (1/28) An email from Chris Fosse; "Wanted to thank you again for the tip on Tioga Bay (Lake Pokegama). The weather and the brackets for the games messed up our fishing but I did go out there between games on Friday for two hours and caught a few fish, it felt good just being there. Saw a group of guys that were catching constantly and had planned on kids trying it after the last game. Unfortunately, the weather said nope and now we were stranded in Bemidji and couldn't get home either. Note: "Winterness" A new word, just made up by Chris is very likely going to re-appear. (Current) From Wired2Fish; "Here are 15 proven fishing knots we think will make you extremely versatile in bass fishing. These knots will give you a lot of options for joining lines, creating loops on lures, snelling, or just getting stronger connections and quick solid knots when you’re in a hurry to get your lure back in the water. We’ve illustrated how to tie each fishing knot, and made it easy to view on your phone out in the boat. So be sure to bookmark this link for later and share it with your fishing buddies. Ice Fishing Report January 27, 2014 Jeff Sundin - Another Day In Paradise North? - The wind was blowing, the snow kept drifting and the temperatures were plumeting again. Ringo was singing a sad song on TV and all I could think about was that "I NEEDED A HUG"! Well, just then, I decided to check my emails. Remember my comment yesterday about over-heating the Abacus by trying to keep track of how fast spring was coming? "Jeff, instead of an abacus, try using a slide rule. They're easier, faster and have the ability to "slide" into spring weather and fishing conditions up there in Minnesota. Right now, down here in Southwest Florida, however, our "cold fronts" have been somewhat hampering our fishing, but not our catching. Colder weather and wind simply dictates alternative fishing techniques. This is quite challenging for fishing guides like me, but I have quite an upper hand because of the number of years I've been guiding and all the different weather conditions I've encountered and fished through. With my long-term fishing history, I can always find places to fish out of the extreme weather conditions. I would say to your anglers, go ahead and Ice Fish with Jeff in Minnesota and then come on down to Southwest Florida to thaw out while you're sight casting to game fish like Snook, Redfish and Sea Trout cruising the flats in shallow water. Note: Mike, believe it or not, I actually have two slide rules and used them to pass my "Semiconductor and Pulse Circuitry Course" at Northwest Electronics. In fact, if I live long enough to get a vacation, then a trip with Captain FlyRod will be high on my list of priorities. When I come, I'll bring the Abacus and the Slide Rules. That will give us a fighting chance at keeping track of all the fish we're gonna catch on that shallow flat. (1/27) Leech Lake Area Lakes, Gary Roerick Says; "Snow, Wind, Cold - Just another day in paradise! We only have 4 weeks remaining to catch or spear those elusive game fish! The last day to catch walleye or spear northern pike through the ice is February 23rd! The ice is looking good on most of our area lakes. This past week I continued to find the ice in the 20”+ range with a variety of locations at just over 2’ of great ice. In fact, I need to kneel on the floor in the fish house to finish cutting the ice and I only have approximately 4” between the auger handles and the floor of the fish house. You may want to start looking now to see where you put your auger extension. If you don’t have an extension for your ice auger, then you may want to check out your local sporting goods store to see if they have the one that you may need during the next month or two. We moved 4 of our sleeper houses this past week, two of them to one of our favorite pan fish lakes, and two of them to different locations in Walker Bay of Leech Lake. It has been an absolute phenomenal week of crappie fishing and spearing of northern pike. Most customers have reported catching their limit of crappies during the late afternoon bite. Many people are spearing their limit of northern pike on each of their outings! The walleye bite on Walker Bay of Leech Lake has slowed some during the past week, probably due to the infamous Alberta Clippers. Most people are still catching some ‘eyes, primarily during the twilight hours of each day. The largest walleye caught and released this past week by one of my customers on Walker Bay was just over 25”. The best walleye activity that I am seeing and hearing is the deeper underwater humps, those in the 30’ to 45’ range. Check out my website at http://roericks.webs.com to see some of the latest catches. We are finding the crappies to be suspended approximately 5’ to 10’ up off the bottom in 25’ of water. One of my favorite hooks to use for crappie fishing is the gold or red colored Kahle horizontal hook. If you feel brave enough to take on some of the latest Alberta Clipper winds, then the fish are waiting for you to come and take them along home to join you at the dinner table. Sharpen your hooks and come and join in on the excitement!" - Gary Roerick Roerick Fish House Rentals 218-224-2836 . 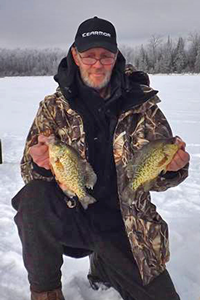 (1/27) From The Iron Range, Greg Clusiau; "Many of my panfish trips find me walking from hole to hole, trying to keep up with hungry crappie and bluegill. When in the feeding mood, especially on shallow waters, they’re almost always on the move, being below you one minute and gone the next. This is where the walking comes in. Sometimes I find myself 100 yards or more from my Clam shelter, which is actually used as a “base camp” when weather allows me to roam about. It never seems to fail. Anytime I’m a good distance from my shelter, which normally houses several hundred baits, I’ll decide to change lures or have a northern pike bite me off. Solution! 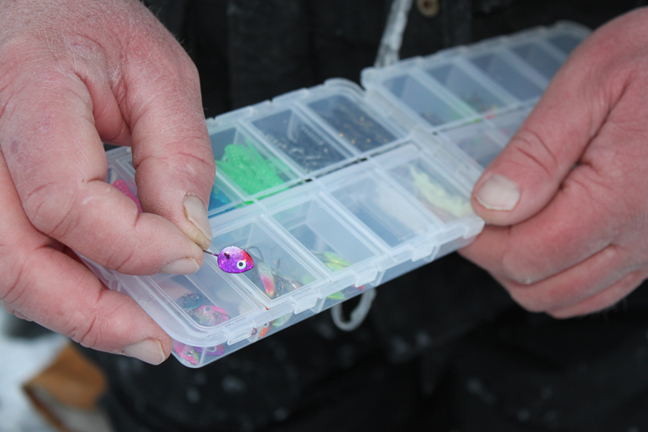 Take advantage of the little tackle box that ... " >> Read Greg's Full Report . Ice Fishing Report January 26, 2014 Jeff Sundin - Icy Cold, Better Than Soupy Slush - At least that's the way I look at it. I KNOW ... you're thinking that guy would have to be crazy to enjoy these arctic cold, icy conditions. Hold on a minute; I didn't say that I liked it, I said that the icy cold conditions are better than being mired in soupy, slippery, sloppy slush! At least this way, we can get out on the ice and fish, that make the time go by a lot faster. Besides, it's almost February and that means that it's almost spring, winter is practically over already! Having trouble buying it? Think of it this way; let's just say that you owed me a million ... anything and you had 80 days to pay me ... See? That oughtta help illustrate. Time goes by so fast that I think I'm over-heating the Abacus just trying to keep track! (1/26) From Wired2Fish; "Zebco/Quantum reels have probably caught more fish than any other reel made and standing the test of time is not an easy undertaking. Better gears, better bodies, better handles and more fish catching gear ratios are just part of the equation. Performance tuned means reels radically designed to tight tolerances that stand up to the test of some of the best anglers in the world. (1/26) On Cass Lake (Pike Bay), I got a nice note from Kendra Detwiler at Ojibway Resort; "The ice conditions here on Pike Bay are good. I think that there are a couple of accesses available, but for convenience my husband has plowed a nice road onto the lake." So far, the winter weather has slowed the traffic, but there have been some groups of fishermen up and on the ice this season. Because they've been plentiful and fun, most anglers have targeted Perch. There are some folks catching Walleyes too, finding scattered bunches of fish at a variety of locations. For a modest $5.00 per vehicle access pass, anglers can drive onto Pike Bay from the landing at Ojibway Resort. Ojibway has winter lodging available too. Kendra added; "We have three very nice winterized cabins and winter rates are $40 per person per night, based on a 3 person minimum. - Kendra and Jim Detwiler, Ojibway Resort 218-335-6695 . (1/26) On Cass Lake (Pike Bay), Wayne and Sue Marchant, Sahkahtay Resort said; "Lake conditions are very good on Cass. We are on the South end and even though we have roads plowed we do not need them as you can drive anywhere. An occasional snow drift might slow you down. But our guests have reported no problem. I don’t think the next couple of days will make a difference with the travel over most of the lake. The public access off hwy 2 is pretty messy though, it seems that all of the snow we have had is drifting into that access. Off our resort and the 2 neighboring ones there is no problem." Sahkahtay has several winter cabins including a large, 5 bed, 5 bath and a 3 bed 2 bath, There are a number of smaller cabins that are available all winter too. For the ice fishing season, they offer special reduced winter rates. 218-335-2424 Sahkahtay Resort . (1/26) Heading Onto Bowstring Lake is easy right now. Bill won the battle with the slush and now has a nice network of plowed roads laid. He has the knack for getting the roads into good fish catching territory and both Bill and Erin are really helpful about trying to put their customers on fish. Now that the roads are in and travel conditions are good, their cabins are filling up. But before we left the resort, Bill did remind us that they are still running an Ice Fishing Special for groups of 5 or more people. $40 per person per night." If your timing is good, they even have a couple of first come, first served permanent shelters on the lake for use by their cabin rental guests. Get the details about rentals, road access and ice conditions by clicking >> Trails End Resort . Ice Fishing Report January 25, 2014 Jeff Sundin - Crappie Action On Bowstring Lake - Was about as good as I've seen it during any winter fishing trip that I can recall. Of course, when somebody leads you by the hand, straight to the fishing hole, good days are easier to come by. That's what happened on Friday when I and Zach Dagel rolled into Trails End Resort on Bowstring Lake. It just so happened that another friend, Steve Carney was staying at Trails End. Carney and his party had been out on the lake a day earlier and they'd already found a good Crappie hole. Bill and Erin pointed us to the plowed road that lead to the area and we were on our way. The only question, were the fish still there. That wasn't too hard to figure out either because Steve and a couple of his buddies were still there when we arrived. By then, they had all of the fish they needed and were wrapping up. Carney said; "We're outta here, you might as well just move into these holes". We did and by the time the transducer of his Humminbird got wet, Zach's eyes lit up like a Christmas Tree. Crappies were still holding in the area and in good numbers. For the first hour, maybe more, the action was about as good as it gets. Watching our electronics, the sightings of fish rushing toward our baits as they fell was a common sight. The fish were holding in the center of a hole. The depth was about 23 feet and the fish were suspended anywhere from 22 up to to about 18. Some of the fish could be attracted into water as high as 12 feet above the bottom. The fish were active enough so that a variety of baits were productive. For me, a 1/16ounce Frostee Jigging Spoon tipped with 3 Wax Worms started off the action. I could have stuck with that combination and continued to catch fish, but between the wind and blowing snow, my knuckles were cold enough to entice me into trying artificial bait. I rigged up a 1/16 ounce Clown Color Foo Flyer and tipped the hook with a Glow Green Whatsit Tail. That turned out to be a really good idea. For me, this winter has been a great one for using the Foo Flyer. Earlier, it had already treated me really well for Walleye and Trout. Now, on this day, the Crappies were all over it too. In fact, there were times that it seemed like the Crappies actually preferred the Whatsit tipped Foo Flyer over the smaller jigs tipped with live bait. Even Zach commented; "I've used artificials a lot during the summer, but I've never fully realized how well they can produce in the winter". I do realize that there are times when inactive fish need to be enticed with a morsel of live bait. But when they're hungry and active, why not use the extra time that you would have spent baiting your hook, to enjoy some extra fishing time instead? In my opinion, The Earth Needs Plastic! By the time we had dialed in on the fish, my friend Mark Thompson and his buddy Ben Erlandson arrived on the scene. The action held up fairly well for them too, but there was a mid-afternoon lull in the action. The fish staged a comeback though, somewhere between 3 and 4 PM and that gave them a chance to round out their limits, making this one a pretty darn easy day for everyone on the scene. I love it when a plan comes together and thanks to a lot of help from a lot of friends, this one did and the day was a really nice one. Thank You! Ice Fishing Report January 24, 2014 Jeff Sundin - The Window Is Open And I'M Going In! - A warm up to the tune of nearly 40 degrees is on the way and I'm not gonna miss out on a single minute of it. In fact, by the time most of you read the report, I'll already be heading out onto the lake. The goal for the next several days will be Crappie and Perch with a side order of Trout. The sleds are loaded, camera batteries are charged up and we're on our way. OH! And I Will Be Seeing You Soon! (1/24) In The Deer River Area, Perch Fishing is finding a higher spot on the priority list. Thanks to improved access and travel conditions on the areas better Perch lakes, anglers are finally able to target productive areas. On Lake Winnie, there are still lots of Perch in the shallows, 4 to 8 feet of water along shoreline breaks. The West side from the Mississippi River mouth all the way up to Ravens Point has been best, at least in terms of size. Their may well be a good deep water bite too, but so far, anglers have stuck to the shoreline and haven't really begun to explore the depths. On Bowstring Lake, Perch are showing up in the same areas as Crappies. Key depths have been 22 to 26 feet of water, along the secondary shoreline breaks. Fishing with blade baits, tipped with small minnows, both Crappie and Jumbo Perch will arrive in small packs, providing spurts of action. (1/24) On Cass Lake, Jason Ball at Cass Lake Lodge shared this optimistic report; "I was just out on the lake today moving (rental) houses. Ice was really good with 2-1/2 to 3 feet in some areas. Travel is pretty good and you can pretty much go anywhere in a 4 wheel drive. There are no ice ridges or areas you have to worry about, but we are starting to get some drifts in certain areas due to the high wind. Cass Lake Lodge is open for winter business and we do provide lake access. With multiple roads plowed, anglers will have excellent travel conditions. The fishing action has generally been pretty good. Jumbo perch have been active in the morning and late afternoon in shallow water, 8 to 12 feet . The walleye have been biting deeper, key depths of 12 to 20 feet. The cold weather has slowed it down somewhat, but it looks like it should be warming up soon! Have a great week!" - Jason Ball, Cass Lake Lodge (218) 335-6658 . Birch Villa Resort has cabin accommodations with great winter rates. They do not offer fish house rentals. 218-335-6795 . Ice Fishing Report January 23, 2014 Jeff Sundin - Ice Fishing Opportunities, The List Is Growing - As much as folks like to moan and groan about the cold weather, it's been doing a lot of good. Lakes around the Itasca Region continue to become more accessible by the day. While snowmobiles and ATVs are still the predominent mode of travel, anglers with pickup trucks are showing up on more lakes, and covering more territory every day. (1/23) The DNR Giveth and The DNR Taketh Away, No? Hold on, don't be so sure about that! - Did you know that the State of Minnesota holds land in trust for the support of public education? It's called School Trust Land and Included are roughly 46% of State forest lands, many public water accesses and much other land managed by the Minnesota DNR for public use. Approximately 290,000 acres are located in Itasca County and 2.2 million acres in Minnesota’s Arrowhead Region. Minnesota State Legislation requires the DNR to "give precedence to revenue generation," including sale of land where necessary. Take it from someone who knows, it's already happened right here in the Grand Rapids area. Thanks to this legislation, The Itasca Gun Club has been uprooted and the public landing at the Canisteo Pit is gone forever, the lake, destined to be drained of water until it's dry. A FREE PUBLIC MEETING, co-sponsored by Grand Rapids' Wes Libbey Chapter of the Izaak Walton League and the Grand Rapids Area Library Program Committee will take place on Wednesday, January 29, 2013, at 7:00 p.m. in the Grand Rapids Area Library. HOW MUCH STATE LAND WILL BE SOLD FOR THE SCHOOL TRUST? Come join us to discuss this important issue. Learn More >> click School Trust Land Meeting . (1/23) Win A Backstage Pass To The Bassmaster Classic. - To celebrate the epic tournament’s return to “Sweet Home Alabama,” Alabama-based fishing electronics manufacturer Humminbird has launched “Humminbird’s Bassmaster Backstage Pass” Sweepstakes. Enter the contest, which runs TODAY through Friday, February 7, 2014 and YOU could rock the bass fishing world, rubbing elbows with the sport’s biggest rockstars. For starters, the winner will receive a free trip for two to the 2014 Bassmaster Classic, including roundtrip airfare, hotel, meals, official Humminbird fishing apparel, All Access VIP backstage passes, and a custom Gibson Epiphone Coronet guitar emblazoned with the iconic Humminbird logo! The winner will also have the opportunity to get his/her new axe signed by Humminbird Bass Elite pros like KVD! Winners will also have the opportunity to watch the official launch each morning from a preferred vantage, daily free admission to the Bassmaster Classic Expo, as well as VIP seating at all weigh-ins, including the Final Day weigh-in ceremony! No doubt, memories to last a lifetime! 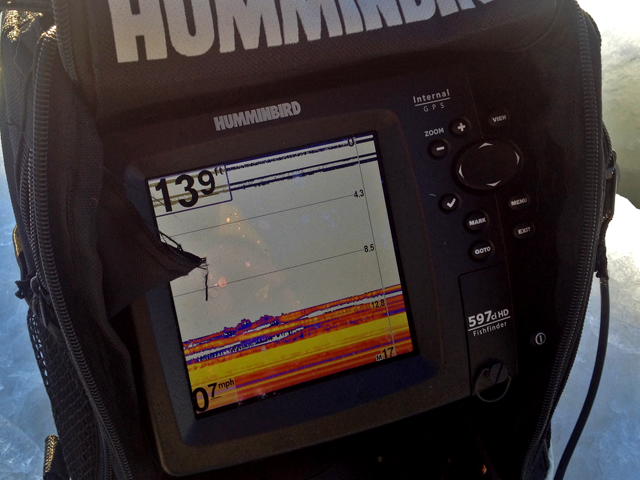 Learn More and enter >> Humminbird Backstage Pass Sweepstakes . (1/22) Word on the street around Cass Lake is that ice conditions and good fishing are both arriving just in time for the 2014 Cass Lake Winter Challenge. 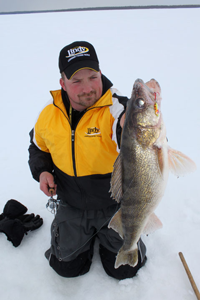 The Winter Challenge, scheduled for February 8, 2014 allows ice fishermen to compete for both large fish awards and a host of raffle drawing prizes too. The contest is a fast action event that takes place so quickly that there's virtually no risk of becoming either cold or bored. The event begins at Noon and ends at 3:00 PM on February 8, 2014. The 2014 Winter Fishing Challenge will be held off of US Highway 2 with access from both Sailstar Marine and the MNDOT Rest Area. Ticket Price $40.00 which includes tournament fee, entry into raffles and drawings. Largest Fish Prizes 1st Place - $2,000, 10th Place - $1,500, 20th Place - $1,000, 30th Place - $1,500, 40th Place - $1,000. There are 5 Raffle Prizes of $500 each, plus more. Other Prizes Up to 40th Place or more. 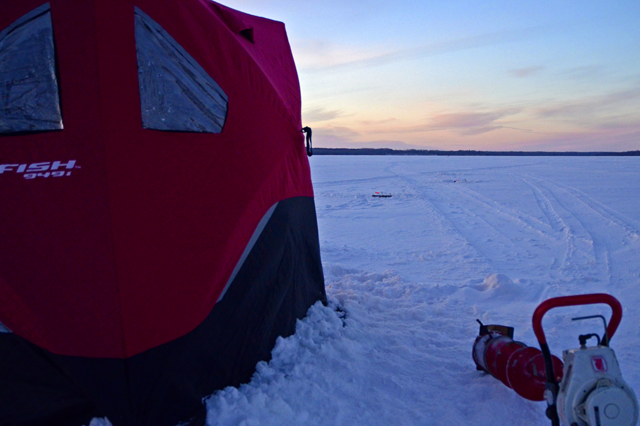 **Portable Houses Allowed on Ice** Learn More and register >> Cass Lake 2014 Winter Challenge . 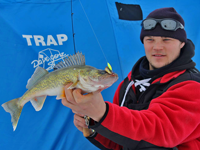 Ice Fishing Report January 22, 2014 Jeff Sundin - Northern Minnesota Ice Fishing Events - There's no doubt that more than a few ice fishing event coordinators are breathing easier now that ice conditions are shaping up. 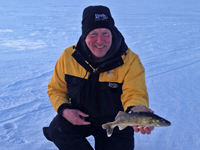 Ice Fishing Report January 21, 2014 Jeff Sundin - Ice Fishermen, Ready To Make A Move? - In Northern Minnesota, ice fishermen with "Wheel Houses" or other large, permanent shelters have been forced to head for Red Lake and Lake of the Woods. With Walleye action on Red Lake tapering off, anglers with itchy feet can begin looking Southward to find fresh, fertile fishing territory. (1/21) Ryan Peterson checked in from Lake Winnibigoshish and said; "Things are changing quickly and for the better on the south end of Winnibigosh. We already have a small road out of Denny"s Resort and I have checked ice and found a new path into fresh territory. I've already staked out the road and we plan having it fully plowed and ready for opening by Friday. So for ice fishermen who are looking to get out with wheel houses or in their trucks, it should not be a problem. Play it safe though and contact the resort before you had up for the weekend. We're confident that the raod will be ready, but the way this winter has gone, we're ready to be surprised by changing weather too". Good luck and be safe! - Ryan Peterson's Guiding . (1/21) On Lake Winnibigoshish - Aerial photos sent opver by Eric Hutchins show vehicle traffic emerging from all over Lake Winnie. Public roads accessing the lake are available at Denny's Resort, Highbanks, Third River and Becker's Resort via the Trappers Landing. (1/21) On Bowstring Lake, Erin at Geiger's Trails End Resort Dropped me a line, echoing reports from folks on the North end of Bowstring Lake. Erin said; "Lake conditions improved greatly over the weekend and travel by truck has become much eaisier. We have several permanent ice shelters on the lake now and a limited number of rentals are still available. We're running an Ice Fishing Special for groups of 5 or more people. $40 per person per night." Get the details by clicking >> Trails End Resort . (1/21) Gus Sheker, Gus' Place Resort on Ball Club Lake; "Great conditions on the lake at this time. Closing in on 2 feet of ice with about 9 inches of packed snow and some drifting. No recent reports of slush anywhere on Ball Club lake. Last weekend visitors from another lake took home 60 fat Perch from 9-13 inches long. They were fishing in the shallow 10 foot range. Most anglers have already passed up the shallow water and moved into the 15-20 feet. It was good to see people unfamiliar with the lake do so well. Keep the fire going, it’s a long way to Spring." - Gus Sheker. Gus' Place Resort . (1/21) On Leech Lake - I discovered yesterday that $6.00 will buy you a road pass to the North end of Potage Bay. In spite of the fact that there isn't an official "plowed road", the trail that leads out of the North Star Campground has recently been traveled by anglers in vehicles. Judging by the distance to the nearest fishing shelters, it's passible and there has been at least some, limited off road travel by pickup truck. For me, I'd feel better about making a trip around the bay with a snowmobile first, just to confirm that the route I choose is a good one. Anglers who do find their way out there over the next few days will enjoy having miles and miles of territory all to themselves. (1/21) Are you like me? 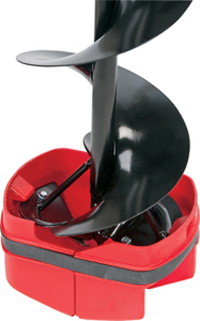 A Lund tiller boat fan who's eye sometimes wanders toward one of those fiberglass boats? OH OH, Look what they did now. Lund has given us even more reason to look because they just introduced the 208 ProVGL Tiller. Yes, that's right, the same gorgeous, smooth riding, glass boat as ther original 208 ProV GL, except this one is a tiller version with all of the bells and whistles. Oh Man! ... now what am I gonna do? >> Learn More about the Lund 208 ProV Tiller . Oh and By The Way, did you know that Lund has come out with a televison show? Yes, Lund's new program, "The Ultimate Fishing Experience" began airing on . Click here for a list of TV stations in your area that carry >> The Ultimate Fishing Experience. (1/21) On Lake of the Woods, Border View Lodge, Mike Kinsella wrote; "Moving again! We are making another jump out a little further. We are just over 7 miles north of Pine Island now and continue to have good fishing. We are still seeing a number of fish in the slot size with others over 28. Incredible numbers of the little fish are still biting which makes for great action and shows the health of the lake. This past week has provided an incredible number of Tulibee. Drop shots and plain hooks are working great on the dead sticks and buck shot rattles have been doing real well while jigging. Glow red, pink, orange and gold have been great colors this past week. It appears to be a rollercoaster week ahead for weather. Each day changes from the next, Monday showing -25 Tuesday 12 then Wednesday back to -23. Hopefully there will not be too much change to affect the bite. We hope the houses are in deep enough water to lessen the impact either way." 1-800-776-3474 Border View Lodge . Ice Fishing Report January 20, 2014 Jeff Sundin - Trout Fishing Opener Gets High Marks - Opening weekend of Minnesota's Trout Fishing season was a good one for Trout fishermen in the Grand Rapids region. Breaking away from our usual tradition of trying to bag a Lake Trout, I and Matt Mattson decided to use the opener to conduct some R&D about Stream Trout fishing. A novice at Stream Trout fishing, I didn't know what to expect. We'd done our homework and based on all of the data we could gather, selected a handful of lakes. They were educated guesses at best, but at least we had some ideas to work on. Getting into and getting onto the lakes was the most challenging part of the weekend. In Minnesota, there is no such thing as a "Commissioner of Making Life Easy For Sportsmen". But if there was, this would be the part of their job that had been least attended to recently. One way or another though, we did figure out how to get on the ice at a few locations. The trade off for all of the work came in the form of some really fun fishing. In many ways, the fishing was easier than I thought it would be. The stocked Trout are susceptible to capture; Hungry, aggressive and unfamilar with fishing pressure, once we had holes drilled, we were visited frequently by fish. The fishing depths were much shallower than I expected. The deepest spot where I caught a fish was 14 feet of water. The shallowest was 4 feet and the average depth of our best action was about 10 feet. There were several baits that attracted the attention of these Trout, but they really had a sweet tooth for Lindy's Frostee Jigging Spoons. Matt Mattson like the Tulibee pattern tipped with Wax Worms, I liked the Glow Red and spent the first day using preserved minnow heads. The trout were happy either way. Learn More about Frostee Jigging Spoon . The other bait that was deadly at attracting their attention was the 3/16 ounce Foo Flyer. When I fished with them, it was almost guaranteed that I'd attract fish into my hole. My problem was that I had brought preserved minnows that were too large for the fish. The Foo Flyers are designed to be fish with a whole minnow, that's part of what gives them their swimming action. The large, salted Shiners were getting struck, but when I tried to set the hook, I was doing the fish a favor by simply ripping the minnow off and giving them a freebie. Next time, I will get some much smaller minnows, maybe some small Emerald Shiners and salt them. I'll bet that these will do the trick. We'll take a break from Trout fishing now, because Crappie fishing is the next R&D assignment for Cub Reporter, staff #003. (1/20) I got a report from Bill Powell at Fred's Bait in Deer River, who checked in after a Sunday fishing trip with his boys. Bill was surprised when they found a lake that hasn't been fished by anyone, apparently all winter log. For most of the winter, ice fishermen have been gun-shy about getting out on the ice because of discouraging reports about slushy conditions. But Bill said; "Resorts are gaining fast on their road systems. Those of you that like to drive out have many more options than before." Even better, Powell thinks that those who have track options should be able to access areas that haven't been fished hardley at all this winter. The improvement in conditions means that many anglers are in for some great fishing. Powell added; "For me, I had been taking the safe route, sticking close to shore and just going to the spear house. That's where I knew I'd be safe and wouldnt get stuck. But now feel that I can safely take the snowmobile to explore areas by myself and dont have to worry about getting stuck in the slush. So look out fish, hear I come!" Click To Read >> Entire Fred's Bait Fishing Report . Bill Powell, Fred's Bait Deer River . (1/20) Leech Lake Area Lakes, Gary Roerick Says; "Awesome weekend of Walleye Action! - Our customers had a grand weekend of walleye catching in most of our rentals. Most houses reported releasing a variety of nice ‘eyes in the slot sized category! Most of those fish were in the 23” to the 25” category. It appears that we don’t need to spend much time talking about ice thickness as it is growing in depth weekly. This past week ice thickness was all in the 20”+ category in all areas that I measured on several lakes. In fact, my 3’ bar on my chainsaw barely made it through the ice while cutting a new spearing hole on Garfield Lake. In locations where we are driving and in the areas that the slush was heavy, the ice is the thickest. Speaking of Garfield Lake, most customers speared limits of nice northern pike this past week, while catching a variety of nice ‘gils, largemouth bass, and some stray crappies! It has been incredible lately watching many largemouth bass come through the spear hole while waiting for the monster pike! Great action for kids as well, watching all of the different species of fish in the large aquarium that we are able to enjoy in our back yard! This week I will be moving some of my fish houses to different lakes now that the slush has solidified and we can drive on many more of our local lakes. Hook selection and bait presentation can be critical, especially if the fish are not aggressive. Fishermen are reporting that on Walker Bay of Leech Lake the lighter colored, multi-colored, glow in the dark jigs, have been working the best. Multi-colored jigs such as the pink/white and lime green/yellow worked good this past week. Single glow hooks seemed to work the best on rattle wheels and then smaller glow hooks with a small treble hook tipped with the front half of a small minnow worked good while jigging for the elusive ‘eyes! One trick that some fishermen used while watching lazy fish on the Aqua-Vu was to take a small hook tipped with either a very small minnow or the front half of a minnow and lay it on the bottom. Some of the fish were curious enough that they came to pick it up and consequently ended up going along home for dinner that evening! Now is a good time to drive to your favorite ice fishing location and attempt to ice some fresh fish!" - Gary Roerick Roerick Fish House Rentals 218-224-2836 . 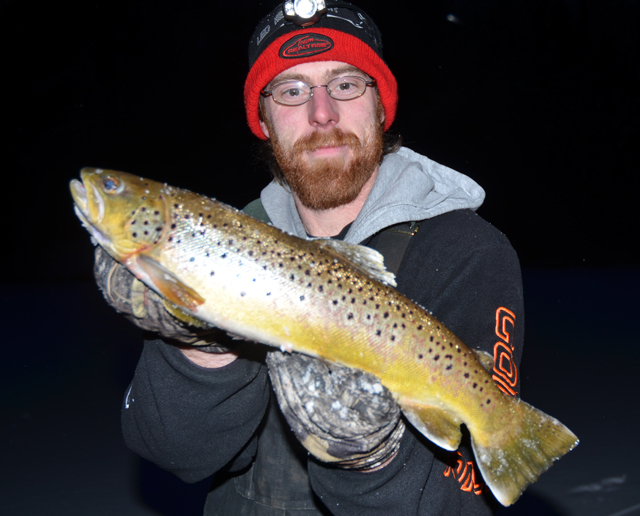 Ice Fishing Report January 19, 2014 Jeff Sundin - Back To The Drawing Board - The Minnesota Trout Fishing opener was a good one for I and my long time pal Matt Mattson. After spending most of our past trout excursions looking for Lake Trout, it was a really nice diversion to spend a day fishing for Stream Trout instead. For me, Cub Reporter, Staff #003 it was a busman's holiday. Conducting research for an up-coming special project, combined with a calm day on the water with one of my closest friends. That is until mid afternoon when all hell broke loose and everyon that was fishing the tiny lake was forced to pack up and leave. Everyone on the lake was perfectly legal, all on the up and up, except our pickup trucks were in the wrong spots, all of 'em. That is a story for another day, but still, it forces us to go back to the drawing board in search of yet another fresh location. So, like yesterday, we are on the trail in the wee hours to see what adventure lies ahead. Oh and by the way, I can hardly wait to see how my snowmobile works after it's recent visit to the doctor. You will be hearing all about all of it, soon. (1/19) On Bowstring Lake, Erin at Geiger's Trails End Resort Dropped me a quick text message; "Travel by vehicle on the North end of Bowstring has vastly improved over the past couple of days. For convenience, access the lake via their plowed road. But once out there, you can cover a little ground going off road as well. Crappies are holding in the deep pockets near mid lake structres. A few words with Bill before heading on to the water will help you get pointed in the right direction. " - Erin and Bill Charlton Trails End provides ice access to the public contact >> Trails End Resort . Ice Fishing Report January 18, 2014 Jeff Sundin - On The Ice In Pursuit of A Trout - Remember the old saw about the Early Bird Getting The Worm? Well, that might turn out to be about all I'll get; But I AM on my way to get it. For me, today's Minnesota Trout fishing opener is starting in the wee hours. Don't worry, I'll pit on my badge and drop in some notes this evening. Until then, Cub Reporter, Staff #003 signing out, but never signing off! 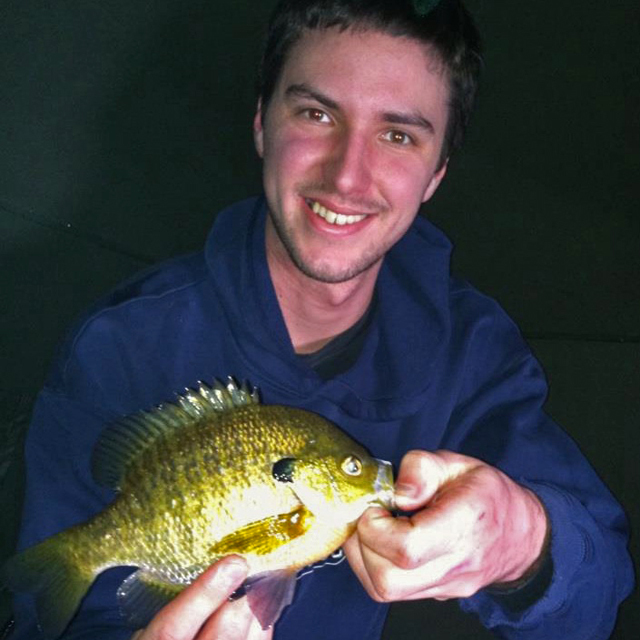 (1/18) Finding Big Bluegills In Grand Rapids, MN was the mission this week on Fish Ed. 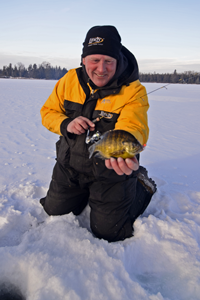 Filling in for Jon Thelen, Jeff Sundin takes you on an ice fishing adventure for big bluegill. Small baits and big fish are the theme of the day in northern Minnesota and Jeff capitalizes by gathering some panfish for the dinner table. Click to view >> Bluegill Fishing In Grand Rapids . (1/18) On Bowstring Lake, Erin at Geiger's Trails End Resort Dropped me a quick text message; "Bill was on the lake plowing all day long on Friday. We now have 3 miles of new road and there are anglers on the lake. Trails End provides ice access to the public contact >> Trails End Resort . Ice Fishing Report January 17, 2014 Jeff Sundin - Sunny Side Up - The sunshine is supposed to make a rare, cameo appearance today and if you're like me, getting out there to see it will be more important than sitting inside talking about it. Especially since ... don't look now, we're gonna get dumped on again tomorrow. So even if it seems a little brisk out there, the wind will be calm and travel conditions on small lakes will be good. It could be a perfect day to sneak out of work a little early and try for an afternoon Crappie bite. It's kind of fun for me to plan this Trout fishing trip for the opener this weekend. It's something that I don't get to do very often and that means that there is still plenty of room for me on the learning curve. The idea of hooking a new fish on a new lake always has been really exciting for me and I think it's gonna be a great weekend. Tomorrow, the search for Trout is going to lead us to a couple of lakes that I picked out after studying the DNR website (see report 1/16). Both of the lakes contain stocked Rainbow Trout, which I think might be a little easier to trick than the Brown Trout that we tried for last time. Keeping in mind that we'll be using preserved minnows, wax worms and artificial tails for bait. I stocked up my tackle box with three baits that I think will fool 'em. Now I'm going to step out on a limb and share my predictions. The Foo Flyer has been treating me really well this winter for Walleyes. Since it's designed to be fished with either whole minnows or artificial tails, I can't see why it won't be perfect for Trout too. 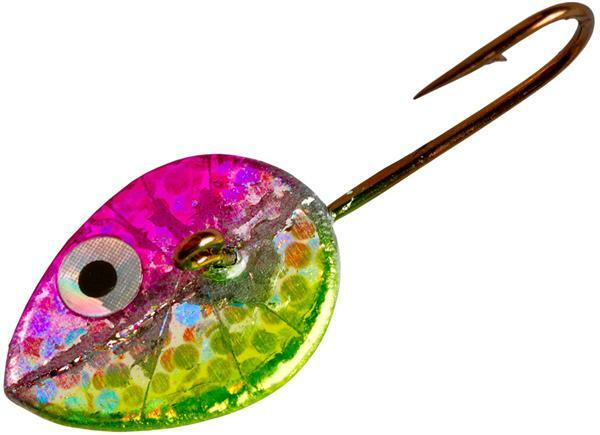 This lure has the ability to give a life like swimming action that will help breathe life into the preserved minnows. Also, knowing that the Rainbows might come in just below the surface, I think that the Foo Flyers will be perfect for fishing horizontally, just below the ice. Based on vibration, sound and flash; The 360 jig has a ton of potential too and it's got one huge key feature, it's new. The fish haven't seen this one yet and I'm guessing that they'll respond favorably. We'll be able to load up the treble hooks with Wax Worms for smell that will help trigger strikes. 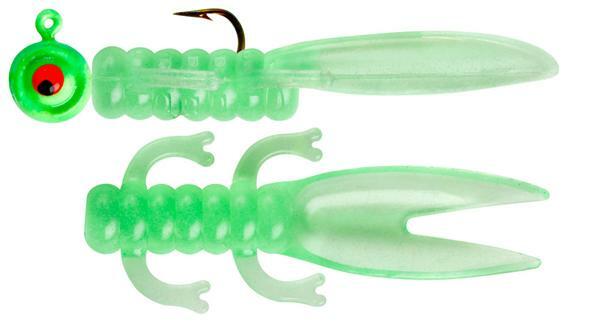 The Slick Jig is another bait that can Multi-Task. I can use these with the preserved minnows and take my pick of whether I want to pound the bottom, use it as a swimming bait or even dead stick with it. At times, these baits have the abilty to get fish really fired up and I've seen some amazing acts of aggression performed by Walleyes on them. Maybe the Trout will react to them the same way. 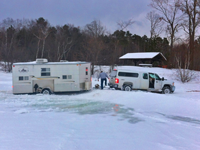 Ice Fishing Report January 16, 2014 Jeff Sundin - What A Great Day For A Change Of Plans - On Wednesday morning I was a little disappointed in our decision to call off our fishing trip. It didn't seem like the weather was developing as forecast. By early afternoon though, strong winds and blowing snow did arrive and my pile of finished paperwork was looking pretty darn good. That gave me some extra time to do my homework for the upcoming Trout Fishing Opener. Yes, Saturday is the big day and we are planning to arrive at the lake early, with enthusiasm. I'm especially excited this year because instead of trying for Lake Trout like we usually do, we're going to focus our attention on a few of the Itasca area's designated Stream Trout lakes. I know that many of you already know more about fishing for Stream Trout than I do, so I'm not going to pontificate about where to go or what to do. That is unless we do really well, then I'll feel compelled to brag it up a little bit. What I can tell you, is that the Minnesota DNR has made the task of researching lakes really easy. Here's a link to the entire list of Minnesota's Designated Trout Lakes . From there, clicking on the name of the lake takes you straight to the Lakefinder section of the DNR website. The lakefinder easily leads to stocking reports for all of the designated Trout lakes. ... and in a few hours, I had more ideas than I knew what to do with. That, combined with some anecdotal stories from friends and I feel like our odds of success have risen dramatically. (1/16) News from around the Lake Winnie area remains unchanged. Rental operators continue making progress with their plowed roads, albeit in small steps. Access to the lake for anglers with trucks remains limited, but available. On the West side, the road out of the Trappers Landing is in good shape and leads to some good Perch fishing territory. On the South end, Denny's resort has a plowed road leading up the East side of the main lake drop and fishing for Walleye, Pike and Perch has been fair. On the East, Highbanks has a road that takes their customers out to a variety of structures including some of the mid lake humps and bars. At the Northwest corner, the Third River landing road is in good shape and leads out to the main lake. Reports of good Perch fishing came in last week, there were some panfish coming in as well. News from that corner of the lake has been quiet this week though, so you'll have to do your own exploring. Off Road travel can easily be accomplished with snowmobiles and track machines. But off road travel by truck should absolutely be avoided. On Leech Lake, access to the West side is good, especially into Walker Bay. Fishing reports are spotty; Walleye and Perch fishing has it's up and downs and some days the Perch have run small. Walleye fishing has been fair, but for the best chance of getting a good catch, you should consider fishing the "night bite". Most of the areas small waters are accessible by snowmobile and on some, there are user developed roads being carved by local anglers. Panfish action has generally been good, especially during late afternoon and early morning. Ice Fishing Report January 15, 2014 Jeff Sundin - What A Great Day For A Change Of Plans - Ever wonder how someone who fishes every day gets time to clean up paperwork and do chores? Mother Nature takes care of it. In fact she plans to dish out a little spare time for lots of us today in the form of snow, driven by a 25 MPH South wind. That forecast was enough to force our decision to cancel day 3 of our fishing on Lake Winnibigoshish. We'll be back later to pick up where we left off, but our urge to enjoy frozen eye lashes was already satisfied yesterday. At least enough to carry us through a couple of days without fishing. With less than an inch of new snow predicted, I doubt that there will be a huge impact on the ice conditions of most lakes. But there could be some drifting in shoreline areas and accesses, in particular, the ones located on the North and East sides of larger lakes. On the bright side, the strong winds have potential to help improve ice conditions on many lakes by blowing existing snow away from slushy spots. If it works out that way, it might be worth putting up with a slap in the face from Mother, the originator of "tough love". (1/15) From Jared Gitter; "Hey Jeff, next Thursday I am heading to third river flowage on Winnie to introduce a friend to spearing. We plan on fishing off the clay banks Friday morning and heading to high banks that evening because we are staying at the gosh dam place. I was hoping you could give me some pointers on pan fish? If I'm wasting my time on clay banks? Should I try Cutfoot? Are there better places to get out then high banks? I plan on staying as mobile as possible but (only) with a truck. I will be hole hopping until I catch them! A) Well Jared, in my opinion, fishing anywhere is never a waste of time. 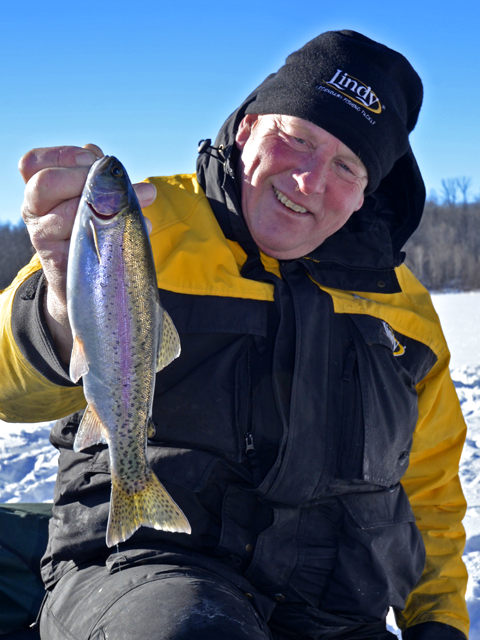 Over the years, the clay banks area that you mentioned has produced a lot of fish for lots of ice fishermen. At the moment, the access road to the Third River landing is in good shape and several anglers have reported good travel conditions all the way out to the entrance of the big lake. Once you get there though, you will be at a dead end. I don't suggest any vehicle travel, in any "uncharted territory" on the main lake. The same scenario applies for the plowed roads out of Highbanks, Denny's and the Trappers Landing at the West side. Rental operators have roads now and they are in decent shape. All of them though provide access to a fairly limited territory and once you're out there, you'll be committed to fishing the territory nearby those roads. Fishing in Cutfoot Sioux could play right into your hand, especially if conditions remain unchanged. There are already a number of anglers moving around the lake in vehicles. Some are using the "user developed roads" that have cropped up, others are getting away with driving off road. If you don't already have a Lakemaster chip for your GPS or if you don't have a GPS at all; Then swing into the bait shop on your way toward the Gosh Dam Place and pick up a paper copy of the map. For panfish, study the areas where there's deep water (25 to 35 feet) adjacent to large shallow water flats. Right now, you'll find the panfish in the main basin over the deep water. But, if you fish the breaklines, points and inside corners in 6 to 12 feet of water, you'll have a great chance at Walleye and Perch too. If you do plenty of "Hole Hopping", you will find some fish. By the way, we will all be expecting a report! Good Luck. (1/15) From Bill Hoffman; I've been reading your fishing reports and watching your fishing videos for quite some time and I have never heard of you fishing for whitefish. A) Truthfully Bill, I'm kind of in the same boat (so to speak). We have caught Whitefish, mainly while targeting Lake Trout in Canadian lakes. But close to home, opportunities to catch Whitefish are limited and to target them, an angler needs to rely on a series of lucky breaks all coming into alignment at once. We catch a lot of Tulibees (Northern Cisco) though and they are very similar to Whitefish. There are many more opportunities to fish for them and they are both plentiful and fun to catch. Contact the MN DNR Fisheries Manager for the area you plan to target. The only question you need to ask is where you can obtain a list of the lakes in your area that have fishable populations of Whitefish. The list will likely be a short one. Next, study the maps for each lake and pay close attention to structures located in deep water. Except for the fall spawning run, Whitefish are typically found in the deep water, main lake basins. They do like structure though and finding deep points, sunken islands or bars can help you pin them down. One of my best experiences with Whitefish came along when I fished a gravel bar that topped off at 45 feet of water, surrounded by depths of 80 plus feet. Fishing near the bottom, along the breakline, I caught several Whitefish using a 3/8 ounce jig tipped with a 4 inch white tube. Starting from scratch, you could easily use the same tactics today. 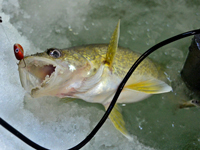 Whichever ice fishing rod you like to use for Walleye would be just perfect for Whitefish too. For me, a 28 inch medium light rod, spooled with Lindy's 5 pound test ice line is ideal. Jigging baits in the 1/4 to 3/8 ounce range will get you down deep enough. If I was heading out to try it today, I'd bring some Rattlin' Flyers, some Foo Flyers and a few 3/8 ounce jigs. For bait, some small shiners, a container of Wax Worms and a few tubes. At the lake, I'd drill some of my holes on the structures, but I'd also drill some of them near structure, but over the deeper, open water. Even though it's not common to hear about Whitefish angling, it's not that much different from fishing for Walleyes. If you're on a lake that has enough fish in it, you will find some. Once you mark them on your electronics, use common sense. Jig a little, dead stick a little ... you get the idea. Note: I'm sure that some of you know more about this than I do. I, along with Bill, would appreciate hearing your two cents worth too. Please, drop me a line and share your ideas or just use our facebook page >> Fishing Reports Minnesota . (1/15) From Mike Nolan; "Jeff, my grandkids don’t like for me to us this word “stupid”, however, the picture of the ice house trailer getting stuck brought to mind this word. Having been told by you and any little bit of common sense would tell you not go on the lake unless total safety was in place. We had 70 degrees here in Kansas, keep up the good work. - MHN "
A) Well Mike, All I can do is try. I don't think those guys read my reports though. Sometimes I'm amazed by how many people do. But what amazes me even more is how many people don't. Especially when the information is accurate and free. I'm glad that your weather is nice down there. I'm looking for an excuse to head someplace warm where my dog can hunt a little bit. Ya never know, if work quits getting in the way, maybe I'll fire up the jalopy and swing through. (1/15) From Wired2Fish; "Top Ten Stories Of 2013 - We went back and looked at our analytics for the year to see what articles and videos were viewed and read the most. Here is a look back at the top headlines and videos from 2013 on Wired2fish.com Including #1 Five Bass Rigs That Every Angler Should Know and ... see the whole list >> Top Ten Stories of 2013 . (1/14) On Lake Winnibigoshish; Starting at Bowen's Flats and heading West, we traveled by snowmobile, about 5 miles to our first fishing spot. along the way, we did encounter 3 or 4 patches of slush along the way. They were very small though and were only found underneath the deepest remaining snow drifts. If visibility had been better, we may have avoided them entirely. We also encountered one small patch of rough, broken ice, but easily found a way to steer around it. There were lots of stretches where the surface was snow free, surface ice exposed to the cold and now frozen solid. It would be foolish to attempt driving a vehicle across any uncharted territory, but snowmobiles, track vehicles and even certain ATV's would get you around nicely. Rental operators are making headway with their roads too and are providing service to anglers who need to drive vehicles. Their road systems are slowly, but steadily improving and provide access to broader range of locations every day. When we got to the first spot that we intended to fish, we discovered that a group of anglers had fished the spot already, apparently on Sunday. That presented a problem because numerous holes, drilled in areas where the snow was still deep, caused some flooding. Deep, slushy snow and standing water forced us to make a move to an alternate spot. At spot B, the snow cover was much lighter and when we drilled our holes, there wasn't any sign of flooding. So from here on out, my game plan for choosing any spot, will include assessing the snow depth. If it's deep, we won't drill. That will help prevent new patches of slush from cropping up. Once we got set up and started fishing, the action wasn't bad, especially for mid day under what had now become a clear, bright sky. An occasional walleye, then a Pike then a Walleye ... back and forth until we had caught 7 or 8 Walleyes and 5 Pike. Throw in an Eelpout for good measure and I guess that you could call it a good day. Especially when you consider that it was literally like sticking a pin in the map, randomly choosing one of a hundred possible fishing spots. The spot was a mid-lake hump that tops off at about 19 feet. The tip of a point, over 22 feet of water provided a travel route for the fish and an ambush point for us. The Walleyes we caught were typical Lake Winnie "eaters", ranging in size from 13 to 16 inches. Nothing in the protected slot on this spot at all. The Pike were eaters also and ranged in size from 22 to 24 inches. I caught my first couple of fish using the same FooFlyer that I had tied on for my last Walleye trip to Red Lake. Once I got a firetiger 360 jig rigged and tipped with a minnow head, I used that for jigging while I used the FooFlyer rigged with a whole minnow as a "dead stick". I like that combination because either one of those baits allow me to fish aggresively if I want to, but also allow for a more subtle presentation when I need it. On this day, the fish eventually taught us that they wanted the 360 Jigs and they wanted to see them jigged fairly aggressively. We were finished reaching our goal before it got dark, so I'll never know if there was a "hot evening bite" or not. From past experience though, my guess is that there would have been. So overall, I'd have to consider this a signal that you'd have a good shot at catching some Walleyes on Winnibigosh right now. 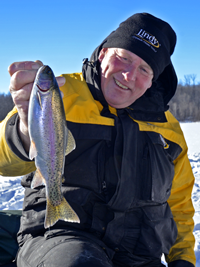 (1/14) Leech Lake Area Lakes, Gary Roerick Says; "Midway through winter and fishing is good! - As we stated early on in the fishing reports, the slush will be a problem for an extended period of time this winter and we needed to give Mother Nature time to do her thing. Well, it is nice to report, Mother Nature gave us some brutally cold weather and we are now driving on a variety of lakes that had lots of slush for the past several weeks. I did not encounter any slush pockets during the past week while traveling many miles over a myriad of local lakes. The ice continues to gain in thickness on all area lakes. Based on my measurements on many locations, I am happy to report that all ice measured was in the 14” to 22” category. In fact, I needed to put my 36” bar on my chainsaw for cutting spearing holes as the 24” bar would not reach while cutting a new spear hole this past Friday. Many customers in my rental spear houses were able to spear their limit of 3 northern pike this past week while also catching a variety of bluegills, an occasional crappie, largemouth bass and yellow perch! Most of the northerns were in the 2 to 5 pound category. I am not aware of any northern pike speared during this past week above the 10# mark! It is also very nice to report that many of the fishermen caught a variety of walleye this past week on Walker Bay of Leech Lake. The largest walleye caught and released in one of my rental houses was 24 ½” in length. Many fishermen reported to me that this past Friday night was an incredible walleye bite starting around midnight and went until daylight on Saturday. You can go to my website at http://roericks.webs.com to see some of the latest photos of fish caught. Walker Bay of Leech Lake continues with a great night bite! People that are going to fish Leech Lake need to remember that unlike many other area lakes, Leech can have an incredible night bite for walleye. Many local fishermen primarily fish the twilight hours of each day with the night twilight typically better than the morning twilight. I personally, along with many of my customers, have found the best bite for ‘eyes on Walker Bay have occurred during the middle of the night. We are now approximately “Midway” through the winter game-fishing season. I started the ice fishing season with 6 houses out on the ice on December 1st, now 6 weeks ago, with the walleye, northern pike and bass seasons ending in 6 weeks from today on February 23rd. Okay folks, now is the time to venture to your favorite ice fishing location in the Leech Lake Area, as time is running short!" - Gary Roerick Roerick Fish House Rentals 218-224-2836 . Ice Fishing Report January 13, 2014 Jeff Sundin - That Was Nice - It might not have lasted too long; But the weekend warm up came as welcome relief for everybody who loves the outdoors. The sound of snowmobiles in the distance could be heard everywhere and Ice fishermen were out on Itasca area lakes both big and small. Some catching, others not, but all smiling. Now, lets cross our fingers that the warm weather was enough to improve sloppy conditions on some of the area's more stubborn lakes. You can expect frequent updates from both Lake Winnie and Leech Lake as they are are both gonna be smack dab in the center of my radar screen this week. From the corner of my eye, I'm keeping track of the hourglass too as we begin the countdown to Minnesota's Trout fishing season next weekend. (1/13) On Lake Winnibigoshish , I noticed a definite uptick in the traffic on the lake this weekend. Warmer weather did it's part to attract anglers to the lake. But improving travel conditions are helping to encourage ice fishing as well. Along the North shore, I saw no evidence of vehicle travel, but there were a dozen portables scattered along the break at Bowen's Flats. Further out, I could see a line of larger permanent ice fishing shelters. I was suspicious that someone had punched a road out from the East side, so I did some checking. Highbanks Resort does have a plowed road leading to their rental houses that supports vehicle traffic. There are also some private ice shelters out there. Even though off road travel is not advised, you can leave your vehicles parked along the road and then be able to travel a shorter distance to your fishing hole by ATV or Snowmobile. I do know that there are also a number of small, user developed roads popping up all around the lake and in Cutfoot Sioux also. When I'm back up there today, I will investigate more thoroughly, but vehicle traffic is already becoming more attractive than it was just a few days ago. As always, USE YOUR BEST judgement and if don't take unnecessary risks. There are more fishing spots than you can ever get to anyhow, so stick with the ones that are most easily accessible. Pressure ridges began cropping up as the weather warmed, so it's going to become important to figure out ahead of time how to access the section of the lake that you want to fish. Another side effect of the warmer weather will be a short term increase in the areas that contain slush. That's going to be good news over the long term and as conditions develop further, I will let you know. (1/13) On Upper Red Lake, Walleye action remains good. I ran into a group of very happy fishermen last evening. They were just returning home after a day on the lake and reported good travel conditions and good fishing. The group of 6 had captured their limits of keeper size Walleyes and were heading toward the frying pan. (12/13) From The Iron Range, Greg Clusiau; "I finally put in a full shift last weekend, fishing both Saturday and Sunday. Both days were very productive, catching Upper Red Lake walleye on the first day, followed up by icing a bunch of nice crappie and bluegill on the next. 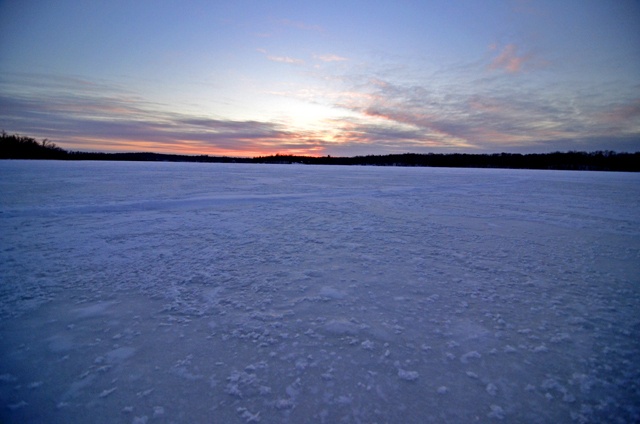 On Upper Red Lake, Going out of West Wind, lake travel was good, with many miles of plowed ice roads available to us. We traveled to a spot that Grand Rapids Guide, Reed Ylitalo had fished two days prior and felt our chances were quite good at going home with an Upper Red Lake limit of four walleye under 20". Ylitalo quickly pulled two small walleyes to the surface, both of which were released back down the hole. It wasn’t fast and furious action but just enough to keep us in that same area for the entire day. The fish were ..." >> Read Greg's Full Report . (1/13) On Lake of the Woods, Border View Lodge, Mike Kinsella wrote; "It has been nice to be out of the -20 degree weather. It would seem the fish do not mind it either. The bite has remained steady with plenty of keepers being caught. We have also continued to have many in the 22-26 inch released daily there have also been a number of Walleye over the 28 inch mark. Anglers have been doing well with drop shots or plain hooks. This week there has been a trend of smaller presentations working well. Still the gold and glow colors are working well. Our road goes about 7 miles north of Pine Island. We are currently in 33 feet of water. The week ahead shows temps changing from around 10 above to 10 below. Hopefully nothing too drastic which could change the bite we have been in so far this year." 1-800-776-3474 Border View Lodge . Ice Fishing Report January 12, 2014 Jeff Sundin - "January Thaw? Why Not?" - HEY! Good things happen to people all of the time; It might just as well be us, right? That's the theme around Deer River these days, at least it is for me. After seeing the vast improvement that occurred on most smaller lakes after the most recent warm up, it's hard not to optimistic about the warm up we have in store for today. Larger lakes have healed somewhat too during that same time, but so far, not enough to clear up all of the slush pockets, hiding under deep, drifted snow. But if there were dozens of small lakes, off to a horrible start during the early season and they are now in fantastic shape. Then just maybe, this will be enough encouragement for the larger waters too. Oh I know, travel conditions on many of those small lakes aren't suitable for vehicle travel, but they never are and they do remain ideal for Snowmobiles, ATV's and the good old fashioned human foot. Ice Fishing Report January 11, 2014 Jeff Sundin - "A Good Time For Lightweights" - Another day without dramatic changes of ice conditions leads me to reiterate; There are plenty of opportunities around the Itasca area to fish and we want you to come and have fun. But your on ice travel plans should rely on snowmobiles, track machines or for your favorite small water spots, hoofing it. If you have no other choice but to drive a vehicle on the ice, then find and use the roads that have been developed by rental operators. Please do everyone a favor; Forget the urge to play Amerigo Vesspucci in a pickup truck because it will only lead you to trouble. For me, Panfish and Pike fishing on smaller lakes is the idea that makes the most sense right now. For the past week, slush problems on small lakes that I've fished have been minimal. Ice thickness has ranged from 12 to 14 inches and the snow pack is only a couple of inches. Small water Sunfish and Crappies are becoming more active and over the past few days, Pike have been moving as well. On Friday, we enjoyed our first episode of what I'd call serious action. It did not last all day, but for a few hours, there were Bluegills and Sunfish of every size, Crappies and even some small Pike all hitting at the same time. The key depths were from 15 to 19 feet, located at the edge of a hole that dropped into 30+ feet of water. Small groups of fish were roaming along the shallow side of the breakline. Each pack of fish varied in sizes and numbers. There were Sunfish as small as 3 or 4 inches ranging all the way up to a couple of 10's. But most of the fish were in the 8 to 9 inch range. Crappies varied in size too and were the most active early in the morning. In fact, as soon as we drilled our first holes, they struck aggressively. But I don't recall catching any Crappies after about 8:30, so it's likely that late afternoons would present an equal opportunity. Our approaches to presentation varied, but the outcomes were similar. Small baits were not the way to go yesterday. Larger jigs tipped with 3 or 4 grubs attracted a lot more attention. I settled on using a number Fat Boy tipped with 3 Wax Worms. My fishing partner went with a 1/16 ounce Rattlin' Flyer tipped with a mix of Waxies and Spikes. The Rattlin' Flyers seemed to discourage small fish from striking, but the larger fish took them readily. It would be a shame to waste this stretch of nice weather, so I'm going to get out on the ice as much as possible this week. Now that I have pan fishing out of my system for a little while, I'm going to spend this week focusing on finding some nice Perch, maybe even a Walleye or two. You'll be the first to know. (1/11) On Bowstring Lake, Erin at Geiger's Trails End Resort; After rescuing an ice fisherman who got stuck on Bowstring yesterday, Erin sent a follow up to yesterday's update. Anglers who wander off of the road(s) on Bowstring are more than likely going to find themselves having trouble with slush. There are still areas where persistent pockets of slush remain under the snow. As it warms up, the hard pack is liable to soften, making more trouble. At Trails End, there is a plowed road and you're welcome to go out and use it. But once you're out there, don't wander away from it. - Erin and Bill Charlton, Trails End Resort . (1/11) From the Lake Winnie Region, Nik Dimich says; "Ice conditions in the Grand Rapids area are currently ideal for travel by snowmobiles, ATVs, side by sides with chains or tracks and some area lakes are now supporting light vehicle traffic. Because of the sheer numbers of lakes in the area and the diversity of fishable waters, check with bait shops and resorts for the most current updates of ice conditions on the lakes you intend to fish. As always, watch out for slushy spots. Bluegills and crappies have been biting in weedlines from 8-12’ and holding off steep ridges nearby. They’re also starting to school up in deeper holes so check your lake maps for the deep basins. 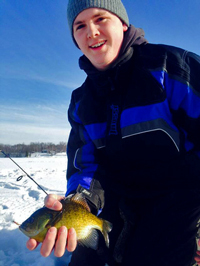 When fishing for panfish, try to use ..." Read >> Lake Winnie Region Fishing Report . Ice Fishing Report January 10, 2014 Jeff Sundin - "Good News About Ice Conditions On Grand Rapids Area Lakes" - Note: Before I get started today. I could use a helping hand. My snowmobile is being naughty and of course, it's happened at the worst possible time. The dealer told me yesterday that it would take 3 weeks to get taken care of and by then, I'll hardly even need it any more. If know somebody in the greater Grand Rapids area who has "The Knack" And has the time ... I would owe you one! Just click here to drop me a line by email . 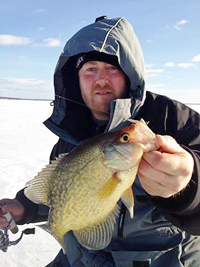 Ice fishermen in search of Panfish should have a lot less trouble finding comfort on the ice this weekend. Warmer weather, combined with improved travel conditions should be just what the doctor ordered. We got a sneak preview today when we hit one of Grand Rapids' better Sunfish lakes in search of Bluegill action. Driven by a gusty South wind, the air was still pretty crisp. It was definitely better than what we've enjoyed recently though and it was a welcome relief from last week's bone crunching cold. I think it influenced the fish too, because they were a little bit more active than they were last week. Still not on a rampage, but at least they were moving around, checking out our baits. The Bluegills we found were milling along the inner edge of a transitional flat that drops into deeper water. On the shallow side, a large weed bed, on the deep side a 20 foot hole. At 14 feet, these fish were located well above the hole, but also a good distance from the shallow weeds. According to my fishing partner, Jon Thelen who was Fishing with Lindy's Tungsten Toads, the trick for getting a strike was in holding the baits nearly dead still. One quick move sent the fish running for cover. For me, a Yellow/Pink Fat Boy was producing strikes too, so I stuck with that. One thing we had in common though, holding the jig dead still was the key. My guess is that the warmer weather will intensify the activity. There are a lot of fish that no one has reaced so far and that, combined with a natural uptick in the action, ought to make you enthusiastic about getting out there. Even though some of the larger waters continue to be hampered with slush problems. Many of these smaller lakes have healed up fairly well. We travelled by snowmobile today, without incident. Walking would have been easy too and I think ATV's would have gotten around just fine as well. There was no evidence of any vehicle traffic, but we really didn't expect that anyhow. On my way home, I made a swing around Pokegama and on that lake I saw several areas where vehicles are moving to permanent shelters. It wouldn't take much imagination to find an area to fish, although there are places where it might be a touch crowded. (1/10) On Bowstring Lake, Erin at Geiger's Trails End Resort; "Bill and I went out on the ice, Bill in the plow and me on a sled. I paved the way for him all the way out to the crappie hole. Once out there, there IS still a patch of slush to the West of the Crappie hole. I did my best to expose it so people can see, but PLEASE be advised that safety is key. This means that there will still be a chance that there is (more slush) elsewhere on the lake. With that being said, travel at your own risk, but we DO have access onto the lake with a semi-safe pathway to a great fishing hole!!!" - Erin and Bill Charlton, Trails End Resort . (1/10) An Update to yesterday's question Round Lake from Judi Hart who posted this to our facebook page; "Only snowmobiles on Round so far. No roads plowed this year because of slush." (1/9) A quick question from Brent Aune; "Some friends and I are leaving tomorrow morning for annual 4 hour trek north up to Big Winnie and Highbanks resort. It sounds like conditions are a bit dicey there. We have fished on Round lake a few times and are considering trying there again. Can you give me any info on what the ice conditions are like on that lake? We have pick ups only, no Atvs or snowmachines so we would like to be able to drive out. Any info would be appreciated." A) Brent, Take this information with a grain of salt, because it's been about a week since I was up there. At that time, there was still a lot of slush under the snow and travel conditions were very poor. Snowmobiles were making it around okay, but the ice fishermen were standing in water as they fished. Since then, we've had a major league cold snap that cold weather may have served to improve the slushy conditions somewhat, but I'd be willing to bet that there are not any plowed roads on the ice at this time. (1/10) At Frontier Sports in Marcell, Paul Larson says; "The “Arctic Vortex” is getting pushed back up north where it belongs. I don’t think there’s any cold air left up there, it was all down here. Temperatures during the last two weeks have been as cold as 41 below zero with wind chill’s close to 60 below. Consequently, there haven’t been many folks out on the ice. I have had a few reports of Crappie and a few Walleye being taken. Spear fishermen are saying even the Northern’s are sluggish and seem barely interested in their decoys. That should all change this weekend with good ice and temps in the 20’s and low 30’s. I don’t recommend driving on the ice yet (there are still slush pockets) but snowmobiles should be just fine. The bait shop is fully stocked and we have an excellent selection of ice fishing tackle. This is the weekend to get out there. All underwater cameras, deer stands and fish houses are now on sale. Drop in or call to find out what’s new on the ice. Ice Fishing Report January 9, 2014 Jeff Sundin -"Ready Or Not, Here We ..." - Wouldn't you just love to hear those sweet words? You Know ... like the ones that every ice fisherman wants to hear; "January Thaw". Oh Man! I KNOW that I would! And according to the most recent forecast, we might just be moving along the right path. With temperatures rising as we head into the weekend, I think it's gonna be a much busier time on Itasca area lakes. By this time during most winters, anglers are anxious to find out if they can drive onto the ice or not. As of today, the simple answer is that on the most of the lakes in our region, anglers who want to cover a lot of territory are still going to need snow machines. There are rental operators on Lake Winnie working hard to get good roads established, but they have been fighting an up hill battle. With a few more eyes and ears out and about during the warm up, the exchange of information is going to improve. (1/9) New Humminbird SmartStrike takes you straight to the action by showing you where the fish are biting at any given moment. Based on search parameters like time of year (season), time of day, weather conditions, and fish species, SmartStrike highlights areas on high definition lake maps where your prey is most likely to be located- before you even wet a line. No more guessing, fruitless searching, or wasted casts. Just fishing. It's like looking into a digital crystal ball. 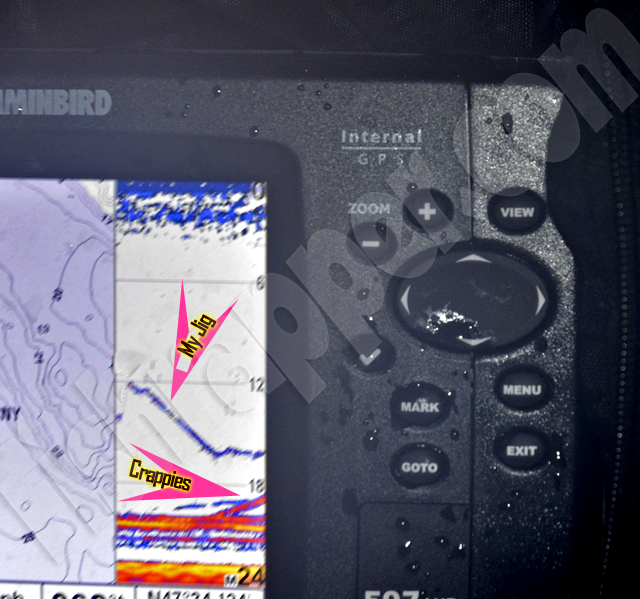 >> Read Article >> Lakemaster Humminbird Smart Strike . 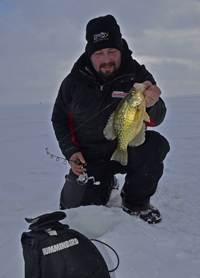 (re-post) Prime Time Crappie and Bluegill Tricks from Lake Osakis, Ice Fishing Tips. 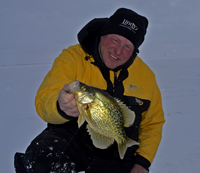 "This week on Fish Ed, host Jon Thelen travels to west-central Minnesota's lake Osakis in an ice fishing quest for crappie and bluegill. Jon shares tips and tricks to unlock this prime time panfish bite which is present on many Midwestern lakes throughout the ice season. You won't want to miss this one!" 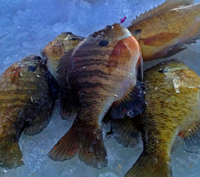 Click to view >> ... Ice Fishing Lake Osakis Panfish . (1/8) Are you like me? A Lund tiller boat fan who's eye sometimes wanders toward one of those fiberglass boats? (1/9) Gus Sheker, Gus' Place Resort on Ball Club Lake; "I can’t speak for the whole region or even my neighboring lakes, but I can say that on Ball Club Lake the conditions are Near Ideal! Ball Club Lake ice is good, clear @ 18-20 inches thick with 6-7 inches of packed snow. 4X4 trucks are driving out. There are no recent reports of slush. The Perch & Northern fishing is excellent right now in 18-20 feet. The Walleye bite is good to fair in 18-25 feet along the drop off. Use minnows and glow jigs for both. The Perch & Northern bite falls off after daylight, but it’s worth hanging out after dark for the Walleyes. I always share the latest trends & GPS info with my customers. *Seasonal RV Site Available; After half a decade with a sold out RV park; we now have a (rare) couple of Seasonal spots open this coming Spring. Our rates are very reasonable with many amenities. If you or any of your friends are looking for a seasonal RV spots in 2014, call us 1-888-246-8520 for details. We are located right in the middle of the Minnesota Great Lakes." - Gus Sheker. Gus' Place Resort . Ice Fishing Report January 8, 2014 Jeff Sundin -"Chipping Away At Snow Cover, Gaining A Little" - Travel conditions in the Itasca area are still tilted heavily in favor of angler who have snowmobiles. Rental operators are chipping away at building roads though and little-by-little, modest roadways are emerging on to the ice. (1/8) On Tuesday, my afternoon tour took me to Bowstring Lake, which compared to a typical winter, looked like a ghost town. Still, there are a handful of ice shelters out there, unoccupied on this day, but showing evidence of recent activity. At the North End, Bowstring Shores Resort does have a short road plowed. It leads to their rental shelters, but no further. At the public landings, only anglers with snowmobiles have been accessing the lake and judging by the traffic on the ice, not many of them have paid this lake a visit so far. Not far down the road, I decided to swing into Little Cutfoot Sioux to see if there's been some traffic out there. There have been quite a few anglers on the lake recently, but none were out there at the time. Ice fishermen have been able to drive into the landing at Little Cutfoot, but they've stopped short of driving out onto the ice. Choosing instead to walk out to their fishing spots from the landing. On Lake Winnibigoshish, rental operators continue to make progress, albeit in small strides. The problem is that they continue to hit small pockets of slush that slow down the production of making roads. At the South end, Denny's Resort has a decent road started, and they are making their way toward the east shoreline. Travel out of the Highbanks area remains difficult. Snowmobiles continue to be the official recommendation and according to the folks who are out there, even snowmobiles aren't all that much fun. Arne Danielson, on the lake conducting the creel survey for the Minnesota DNR says; "It's best if you use the snow machines to make short trips. Maybe a couple of miles to one or two spots at a time". Even if you're not slowed down by slush, you will be slowed down by the hard packed mogels that have formed by strong winds that drifted the snow cover. Danielson said; "Trying to move much faster than about 20 MPH is going to deliver you a bumpy ride out there". On the West side of Winnie, anglers are faring a bit better by using the plowed road at the trappers landing. Whether or not the road leads to any great fishing spots is debatable, but it is a way to gain access to the lake. (1/8) New Underwater Camera Pairs performance With Value - Aqua-Vu® recently engineered the on-the-water equivalent of modern-day LCD TV. The new 715c Underwater Camera gives anglers and boaters all the color and flat-screen performance they demand, and at the lowest retail price ever. Manufacturer of the world’s first and finest underwater cameras, Aqua-Vu recently re-energized the category it created in 1997, offering enhancements such as IP67-rated waterproof monitors and color CMOS camera optics. “IP67” isn’t just another techno-term, but rather a military standard that measures relative protection against dirt, dust and water. IP67 indicates the maximum levels of protection in all categories. Accordingly, these new underwater viewscreens even operate... >> Read Full Report . Ice Fishing Report January 7, 2014 Jeff Sundin -"Tick Tock" - The weather did a fantastic job of holdinglots of us ice fishermen at bay on Monday. I didn't really mind the extra time for getting caught up on some inside work though, especially after earning a few patches of frostbite on my last fishing trip. While I was fumbling around on the computer, I noticed that the winter boat and sport show season is upon us already. A quick check of my hour glass revealed that we are only 123 days from the official Minnesota Walleye Fishing Opener. If you're like me and head for the rivers as soon as they open up, that means you have less than 90 days to wait until open water fishing. Holy smokes, I realized that's just barely enough time to get the boat picked out, ordered and rigged. So on behalf of anyone who's been feeling a slight twinge of cabin fever; I took a short break and found some exciting tidbits of fishing news that will give you an excuse to get up off the sofa and head into town while there's still time. (1/7) A quick question from Brad Lucas; "I was wondering if you would have a recommendation for renting a Fishhouse on Leech Lake? We are looking to rent towards the end of January." A) Brad, I and some of my friends have rented shelters from Gary Roerick. He has spacious houses that are clean and warm. Most are in Walker Bay, but he also has some shacks on a variety of area lakes. You can reach him here >> - Gary Roerick Roerick Fish House Rentals 218-224-2836 . (1/7) Comments from Brian Hiller; "Long-time reader of the fishing reports and huge fan of your willingness to teach what you have learned! I wanted to write because I know you are affiliated with TFO ice-fishing rods in some way. I finally managed to get one recently and sadly had the tip break off for some reason. After checking on their return policy I called up and told them what happened and that I thought the $35 replacement fee was a bit steep for a $40 ice rod. I was put in touch with Brandon, who seemed surprised that a rod had failed, they hadn't had one of those yet, and offered to replace the rod no questions asked. The customer service was fantastic and the fact that I was the first warrantied rod they had ever had says something about the quality of the rods as well. Just thought it might something to let folks know about. This company treats their customers with courtesy and respect and they stand behind what is a top-notch product. Reply) Thank you for the comments Brian. It will likely come as a surprise, but actually, I don't have any business affiliation with TFO. Like you, all of the TFO Rods that I own were purchased right over the counter. Once upon a time, I spent about 20 years on the G.Loomis' Pro Staff and watching Gary Loomis in action was how I learned many of my most valuable lessons about working with and for people. I am one of his most devoted fans and it was his involvement with the TFO guys that first drew me into their corner. Since then, I've gotten to know them a little bit and in my opinion, they share many of Gary's core values. At various times, I've done what I could to help spread the word to let folks know about the great value that the rods provide. Thank you for telling your story and thank you for another chance to let even more folks know about this great company and the fine group of people who operate it. If you'd like to read more about the day that I discovered them for myself; use this link to my original >> December 4, 2012 TFO Rods artilce Or for more about their products, jump to >> Temple Fork Outfitters TFO Rods . Ice Fishing Report January 6, 2014 Jeff Sundin - Sometimes All You Can Do Is Smile - The weather does what it wants to do and at the moment, it's forcing more than a few ice fishermen to stay inside. For anglers who have permanent shelters or large "wheel houses", life is still good. Especially if they're parked on one of the big Walleye factory lakes like Upper Red or Lake of the Woods. Walleye action remains good on both, so at least part of the the Northern Minnesota ice fishing scene is alive and well. Ice fishermen like me, who prefer more mobility and rely on portable shelters and fishing in the open are doing a little bit of suffering right now. But in the end, it will all be worth it. What makes me say that is because the super duper cold snap is actually doing rental operators on Lakes like Winnibigosh, Leech, Cass and Bowstring a huge favor. Plagued earlier by problems with slush, many of them might have never gotten a chance to get set up for the entire winter. At least now there's a re-freeze going on and they have a good shot at recovering some portion of their winter trade. Forecasts of a late week warm up have got to be great news for everyone who would love to get in a good weekend of ice fishing. The forecast has me feeling optimistic that my plans to work on some special projects won't be disrupted either, that's good news. So in the meantime, folks like me can just look at this as an opportunity to get caught up on stuff around the office. That way, we'll be ready to jump when the good news comes rolling in! (1/6) On Bowstring Lake, Bowstring Shores Resort, A quick note from Marjean Oelke on our Facebook Page this Sunday said; "Darv had 14-17 inches of ice (On the North Side of Bowstring) where he drilled and he's been driving to our houses." - Bowstring Shores Resort . (1/6) From The Iron Range, Greg Clusiau; "The old saying “the weather’s not fit for man nor beast” certainly applies to our most recent arctic blast. In times like this, I always manage to get a touch of “cabin fever”, feeling like a caged animal wanting to get out there and do something, anything. But then, what little common sense I do have rises to the top and keeps me holed up in the house. I’ve cleaned up my office, twice, so far and really have to think of any possible errands to run, anything to get out of the house but not for long. In two days, I’ve managed an equal amount of trips outside. One was to make the short drive to Blue Lake, near Nashwauk, to satisfy my curiosity factor. I had to find out how the ice conditions were. If any lake had vehicle traffic taking place, it would be Blue Lake. No matter how deep the snow, local anglers usually make a trail to the first couple fishing spots. Sometimes there's even a ..." >> Read Greg's Full Report . (1/6) Leech Lake Area Lakes, Gary Roerick Says; "We are being blessed or cursed, depending on your perspective, with some incredibly cold temperatures this past week. Even the MN Governor got involved in the action by stating their will be no school at the Public Schools in the entire State of MN on Monday January 6th! When I left Church yesterday morning, I asked a young man named Evan, if he was going fishing today. His reply was; “The Governor said we don’t have to go to school tomorrow so I think tomorrow would be a good day to go fishing”! Now there is someone with the right idea, Everyday is a good fishing day! This past week I drilled many new ice holes in a variety of areas and the ice in all of those locations was in the 12” to 19” range. What else would one think when the temperatures are below zero for such a long time, we obviously must be making ice. The other good news is, I was plowing snow on a variety of lakes this past weekend and I did not encounter any slush pockets. However, I did pull two of my sleeper houses from 10th Crow Wing Lake that consistently had lots of slush for the past 3-4 weeks. This week should help seal the slush issues on many of our area lakes. Walker Bay of Leech Lake had great walleye action during the past week. Customers were catching lots of walleyes in a variety of locations. The deeper underwater humps in the 30’ to 45’ range seemed to be better, especially when we were receiving the passing of the cold fronts and with the wind shifting directions every day during the last 4-5 days. The fishermen are catching a variety of sizes, with many of them being in the 2-3 year old category. Many customers were able to take home good eating walleyes in the 14” to 17” category. Check out my website at http://roericks.webs.com to see some of the latest photos of some nice ‘eyes that were landed. The National Weather Service is telling us the temperatures should be in the 20 to 30 degree range, “Above Zero”, by the weekend. This should make for a very nice weekend of ice fishing in the Leech Lake Area! - Looking forward to seeing you out on “The Pond" - Gary Roerick Roerick Fish House Rentals 218-224-2836 . (1/6) On Lake of the Woods, Border View Lodge, Mike Kinsella wrote; "Fishing remains great! We are still around the 32 foot mark and it is providing a great Walleye bite. Plenty of limits to go home and have some fresh to eat while you are here is still the norm. Plain hooks and drop shots have been working well. There have been some large fish over 30 inches caught and released this week, we are also seeing a great number of the 22 to 24 inch Walleye’s being caught and released. We continue to maintain the road so there are options getting to and from the houses. The cold temperatures continue! It looks like we may get a break later in the week, Thursday shows to be above zero for the whole day." 1-800-776-3474 Border View Lodge . (1/6) Ice Fishing Destination, Devils Lake, Ice Fishing For Jumbo Perch and Walleyes "Looking at the genuine jumbo perch in my hand, all I could do was grin. In truth, we had caught several perch that were equally large. Still, there’s something about each ridiculously huge yellow perch that simply brings a smile. Of course, it didn’t hurt that we had also caught a huge number of fish – nor that we were about to go catch a mess of Devils Lake walleyes. Devils Lake, which spreads across more than 220,000 acres in North Dakota’s prairie country, is legendary among ice anglers for its giant yellow perch. Arguably, no major lake provides a better opportunity to catch 2-pound-plus perch through the ice. Devils is not an all-or-nothing destination, though. Extremely fertile and offering diverse and plentiful habitat for the fish, this lake also supports tremendous populations of perch, walleyes and ... " Click To Read >> Ice Fishing Devils Lake with Jason Feldner . Ice Fishing Report January 5, 2014 Jeff Sundin - Brace Yourself For Another Arctic Blast - But don't get too far away from your ice fishing gear. If you're like me, -30 degrees combined with a 15 MPH wind might just be enough of an excuse to skip sitting in the portable today. I think instead, I'll hunker down for a while and finish off some paperwork. Later, if I get the urge to get out and about, it looks like I'll have some good excuses to go shopping. (1/5) Lund Boats Introduces New 2075 Tyee - Fresh from the legendary fishing boat manufacturer, Lund recently engineered an even larger, more athletic sport utility boat - the new 2075 Tyee. The prototypical family fishing rig for the next generation, the 2075 Tyee embodies Lund quality and craftsmanship from bow-to-stern. “Lund entered the sport utility boat category many years ago with the original Tyee,” says Lund Boats’ Engineering Manager Paul Zarn. “It’s an exceptional, high-performance big water fishing rig, but it’s also one that fits the needs of families. Our goal with the 2075 Tyee was to expand upon our current Tyee line with our largest model yet. Customers were asking for a ... Click to Learn More >> Lund Boats 2075 Tyee . (1/5) Ice Fishing Destination, Lake of the Woods - This legendary lake that straddles the U.S./Canada border serves up outstanding ice fishing through a long season that is already underway. One Question Quiz: Lake of the Woods is well known for: A ) Giant walleyes ? - B ) Fast action from a mix of saugers and walleyes? C ) Great daytime bite all winter long? D ) All of the above? You probably guessed it, but the answer definitely is "D" All of the above.” And in truth, those answers represent only a few of the reasons why Lake of the Woods stands out as one of the world’s most renowned ice-fishing destinations. “The resort industry makes it easy for an angler who may not ice-fish quite as often to get out there and enjoy success in an ice house that has been placed in a productive area,” said Nick Painovich, who operates Zippel Bay Resort with his ... "Read Full Article >> Lake of the Woods, Ice Fishing Destination . Ice Fishing Report January 4, 2014 Jeff Sundin - Brace Yourself For Arctic Blast - But don't get too far away from your ice fishing gear. Whether you're on top of the ice, or under it, it hasn't been easy to call the weather ideal for fishing. But for Grand Rapids area anglers who have chosen to tough it out, the fish are doing their best to be cooperative. On Friday, it was obvious to us that the fish weren't much happier about the roller coaster ride of crummy weather than we were. Still, we somehow managed to get what we needed by sheer persistence and lots of finesse. Most of the lethargic fish would move in and out of view, rise to look at our baits and then drift away. Occasionally though, we could tease one of them into striking, by working tiny baits gently above them. I showed up at the lake with 4 rods rigged and ready. Each of them had a different type of lure; A Frostee Jigging Spoon provided a large, flashy search bait. A small Foo Flyer would serve as a search bait too, but a more subtle one. My old reliable Frosty Spoon and my "new old reliable" Tungsten Toad would serve as finesse baits to trigger strikes. It didn't take long to figure out that the search baits weren't gonna be needed. 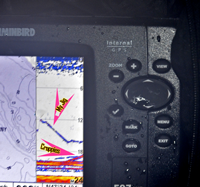 Location was not a problem, we could could see a steady flow of Sunfish on our Humminbirds. Fishing on mid range flat in 15 feet of water, the fish seemed to be everywhere, roaming around over the Marl bottom. The fish were jittery, if I made one sudden move, twitch too fast or jig too much, then most of the "lookers" could easily be scared away. One by one, the search baits came off, replaced by the smaller finesse baits, each of them a different color. Rotating the colors and keeping them tipped with fresh Wax Worms helped a little. At least now, we could coax a strike out of an occasional Bluegill. You'll get to see how the results soon enough, because we had a camera or two along on the trip and they'll be edited over the next few days. That will be fun, but for me, the real takeaway from this fishing trip was that we still have our ice best fishing action ahead of us. So far this season, we've struggled to find places where we could get onto the ice. Then when we finally did, the weather turned so cold that it's forced the fish to hunker down, feeding only marginally and at key times of the day. Sooner or later, conditions are going to improve and when they do, it will be like a brand new ice fishing season starting up. There will be lots of fish that have seen little if any fishing pressure. Fishing spots, even entire lakes that have nothing but up-side potential. So hunker down and avoid getting frost bitten for a few days. 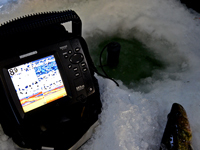 But don't get too far away from your fishing gear, because we could be on the verge of some really good ice fishing. (1/4) On Bowstring Lake, Erin at Geiger's Trails End Resort; "The ice is healing! If you contrast current conditions with what we had last weekend, we're pretty optimistic; At that time, there were as many as 9 inches of slush in certain spots. But with the deep freeze that set in throughout the week, the lake is now creating fresh crust of ice, thickening daily. This is promising news and could help lead us toward having a fresh plowed road sometime soon. Thanks to all of the snowmobile trails created by Boomer and the boys at Here’s My Gear and HSM Outdoors, we have some areas of good hard packed ice to start our work. If the snow leaves us alone for a while longer, we'll still have a fighting chance of salvaging a great winter ice fishing season this year!" By the way, Trails End is running an ice fishing special that includes discounts for groups of 5 or larger. Click here to view >> Bowstring Lake Ice Fishing Special . - Erin and Bill Charlton, Trails End Resort . 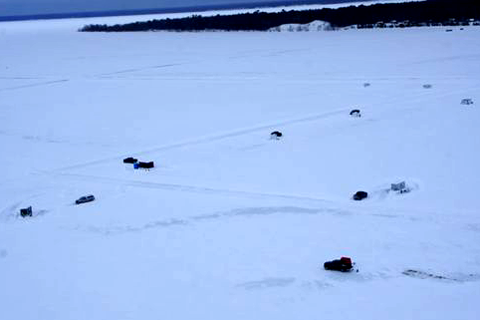 (1/4) On Lake Winnibigoshish, Anglers in small pickup trucks are finding their way onto the ice at the West access. 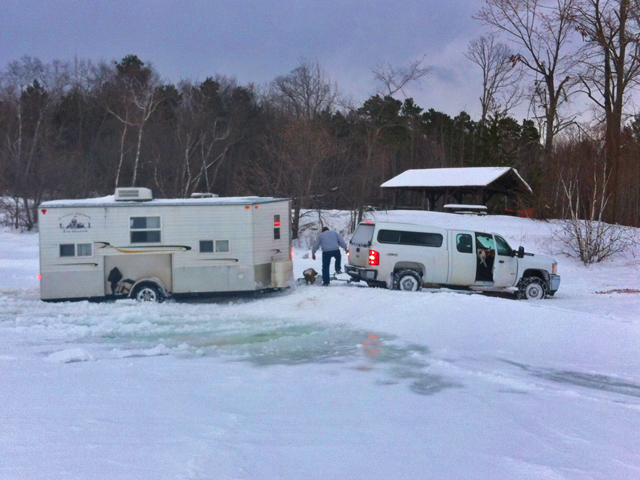 Some are driving to their fishing areas, while others are finding peace of mind by parking on the ice, near the landing. Fishning reports on Winnie's West side are fair for Walleye and Pike. Better for Perch, which are running better than average size so far this winter. (1/4) A question from our Facebook Page, David Johnson wote; "Good fishing, what bait did you finally settle on? Do you like the Hummingbird over the vexilar?" A) On that particular fishing trip, I caught fish on the small size Foo Flyers. But this time, the Toads were the best. The original Toads were already becoming a favorite for me, but the introduction of Tungsten adds another dimension that makes them even better. 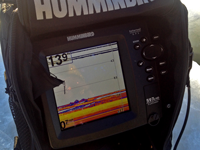 About the HUMMINBIRD ; It's not as much a question about preference of one brand over another, as it is a question about my techinique and individual fishing style. Since I spend every single day of the summer looking at my Humminbird graph, not a flasher, it's kind of a no-brainer for me to use the 597. Viewing the graph screen for me is just a natural extension of the open water season and it fits right in to my style of fishing. For me, I think that the graph not only makes it easier to distinguish between different sizes of fish. But since I'm also seeing their positioning on the screen, I can more easily attempt to determine what species of fish that they are. 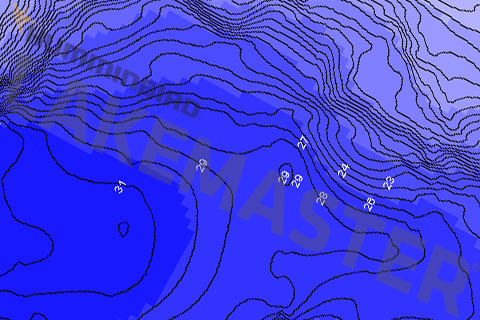 Because the 597 combines the sonar and GPS charts into a single unit, I save lots of time pinpointing the right spots. If I get lonesome for a flasher, or feel like I need it under a certain circumstance, the 597 does provide a wonderful flasher screen view as well as my preffered graph view. 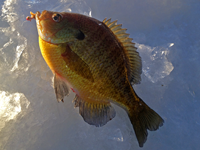 Ice Fishing Report January 3, 2014 Jeff Sundin - Grand Rapids Sunfish, We've Got Some Potential! - Finally! A day on the ice, in a good Sunfish spot, with good ice, no slush and no break downs. Pinch me, is this heaven? After weeks of searching for a good Bluegill hole, I finally hit the right place at the right time. 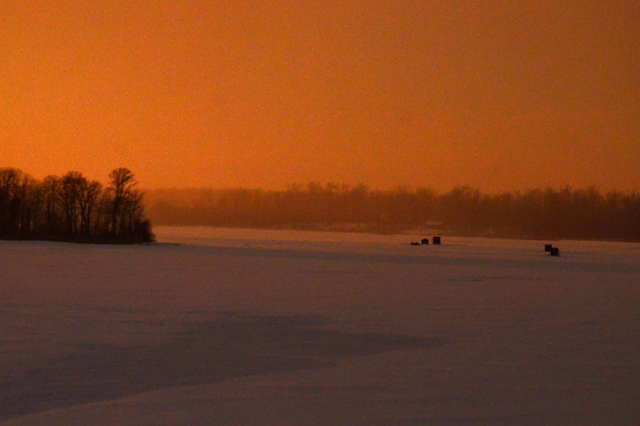 A morning temperature of -40 degrees was discouraging and it looked like another day of fishing gone by the wayside. But luckily, the sunshine and calm breeze combined to warm up the air and heat up the Bluegill fishing in the Grand Rapids area. By the time I caught up on some paperwork and loaded all of my gear, the outside temperature had risen to -10 degrees. Still cold, but with no breeze and plenty of sunshine, if felt darn good so I high-tailed it to the lake. I can't say that I had a plan, I would just be checking spots that had been good in the past. But by the time I drilled my first three holes, the Humminbird was already recording numerous ... Read Full Article >> Grand Rapids Bluegill Report . (1/3) Ryan Peterson has some good news from Lake Winnibigoshish. They have finally navigated a way around the pressure ridge that cropped up and pinned everyone into the South corner of the lake. According to Ryan, they have opened a road out of Denny's Resort that will soon lead ice fishermen around the ridge and out to the main breakline at the Moxie's area. Peterson says that they now have about 14 inches of ice and the smaller, 1/2 ton trucks are moving snow to build the roads. In a few days, the road building will get serious when all of the slushy spots are fully refrozen and they can begin using their 1 ton trucks, equipped with larger plows. At the moment, Peterson reports fair action for Northern Pike and some evening Walleyes. Perch are active but in his words, running small right now. Peterson is optimistic that the move into new territory will allow anglers access to spots that haven't been fished yet this winter. He's hoping that once they open up some fresh holes, fishing action will be good. - Ryan Peterson's Guiding . Ice Fishing Report January 2, 2014 Jeff Sundin - Grand Rapids Area Ice Conditions Are Good - Travel conditions on area lakes steadily improving. On Wednesday, a quick spin around the neighborhood led to more encouraging news. Pokegama, Jay Gould and Bass Lakes are all in really good shape right now. In fact, in certain areas around Pokegama, plowed roads and pickup trucks have replaced snowmobiles. I happened to spot a friend of mine out there and gave him a call on the phone. The sunshine was bright and it was a little early for the first Walleyes to run through the territory that they were fishing. But, he did tell me that the path to where he was fishing had no slush on it and that the shelter he'd set up was on top of 16 inches of solid ice. On Jay Gould, there were numerous permanent ice shelters and about a dozen vehicles parked in scattered places. The lake still had areas of deep snow, but I observed a cross county skier moving effortlessly. That was a signal that slush probably isn't a gigantic problem out there right now either. 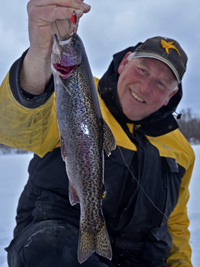 Ice Fishing Report January 1, 2014 Jeff Sundin - More Good News For Grand Rapids Area Ice Fishermen - Travel conditions on area lakes steadily improving. On New Years Eve, another drive along the back roads brought me to a half dozen more lakes. This time I travelled North and East of Deer River. I found more good news, just like magic, lakes that were in horrible shape just a few days ago are on the mend. In fact, I'm becoming fairly confident that our brief, 2 day meltdown was enough to help turn the corner into 2014 with a lot more ice fishing options than we had before. One of my stops was to finish the job of getting my buddy's fish house onto his lake. The project that I'd started last week, was delayed by the slush and horrible weather at the time. Yesterday, the cold temperatures slowed the snow machines. But when they were running, they sat high and dry atop a crusty layer of ice that was once slush. The snow cover was about 4 inches deep, the crusty ice another 6 inches and after that, about 10 inches of solid ice. Using the coordinates that I pulled off of my Contour Elite (read original article), we were able to move the ice house straight to the spot, drill one set of holes and the job was finished. (New Year 2014) Gus Sheker, Gus' Place Resort on Ball Club Lake; "Ice conditions are improving every day, we are around 14 inches of pretty good ice. Some areas of slush still exist and the deep middle of the lake should be avoided. We do not have plowed roads yet and the ice is not safe for truck traffic. The fishermen with ATV & snowmobiles pulling portable shelters are doing very well on Ball Club Lake for Perch and Northern. Our customers in the spear houses are reporting limits of Northerns. The Perch bite is strong with all classes being caught. You will have to sort through them, not every fish is a bucket fish, but there are Many and the action is nonstop during the daylight hours. We have cabins & day houses available with only a 24 hour notice. *Seasonal RV Site Available; After half a decade with a sold out RV park; we now have a (rare) couple of Seasonal spots open this coming Spring. Our rates are very reasonable with many amenities. If you or any of your friends are looking for a seasonal RV spots in 2014, call us 1-888-246-8520 for details. We are located right in the middle of the Minnesota Great Lakes. HAPPY NEW YEAR" - Gus Sheker. Gus' Place Resort . (New Year 2014) On Lake of the Woods, The report from Sportman's Lodges; "Catching holding strong! - It has been a great December for walleye and sauger fishing in our neck of the woods. A very active bite and many big fish and big catch days. The best bite right now has been in 23’-28’ jigging with gold or pink jig, stop sign or #32 macho minnow tipped with a whole minnow or some anglers are swearing by just the minnow head. Drop your line to about 6 inches off bottom and bring along or rent a vexilar for the best experience. We have 22-23 inches of ice in the areas we travel and fish at this time." - Sportman's Lodges, Lake of the Woods Reservations: 800-862-8602 . (New Year 2014) From the Lake Winnie Region, Nik Dimich says; "At times jigging aggressively has created an action bite, however, I’ve noticed that sometimes downsizing our presentation (tackle size) has helped us trick more fish into biting, especially when the walleyes are in a neutral/negative-feeding mode. Along with Upper Red Lake I’ve had clients on Bass, Ball Club and Pokegama Lakes. Each lake, as well as many others, are ..." Read >> Lake Winnie Region Fishing Report . Bowstring Crappie action was good for Grand Rapids Fishing Guide, Zach Dagel. Thanks to a tip that allowed us to zero in on fish quickly, Zach was in the action right from the very first minute of fishing. The quintessential "Hot Bite". When you see fishing moving toward your bait as it's falling, you know you're gonna Get Bit! Most fish were between 10 and 11 inches. Occasionally though, a better example would swim into the territory. For this week's episode of Fish Ed. Host Jon Thelen snuck onto "The Big Lake" to bag some Walleyes. While he was at it, Jon discovered that there's more to Lake Winnie than just a healthy Walleye population. Photo courtesy Eric Hutchins: Aerial views of Lake Winnibigoshish reveal truck traffic on plowed roads. Access raods are available available at Denny's Resort, Highbanks, Third River and Becker's/Mcardles Resort via the Trappers Landing. Knowing about the huge back log for repairs at snowmobile service departments everywhere. I'll bet that some of you need a guy with "The Knack" right now. If I'm right, then here's the guy you need; Chad Schumacher, Northland Salvage and Service. 218-256-9691 or Email . By Sunday afternoon, we'd been on 3 lakes, learning a little more each time we drilled a hole. For me, the most unexpected revelation was the shallow location of these fish. Fishing depths ranged from 4 to 14 feet. Trout in the 12 to 14 inch range were moving along the shoreline breaks in 10 to 15 feet of water and they were agressive until mid morning. Still curious, but finicky at mid day and at evening? Who Knows? That'll make a good story for another day. The Foo Flyer has the ability to give a life like swimming action that will breathe life into the preserved minnows we need to use for Trout. Knowing that Rainbows might come in just below the surface, The Foo Flyers will be perfect for fishing horizontally, just below the ice. In this video, Jon Thelen shows you how to use the Foo Flyer. Yes, I Know, that's not a Trout. But the video is perfect to help you learn what makes the bait unique and how to fish it. Photo Nate Anderson (2012): Who stepped over one of our discarded ice holes, dropped in his jig and showed us how to catch a trout. For me, 2014 is gonna be a good year, I can just feel it! The Walleyes we caught were typical Lake Winnie "eaters", ranging in size from 13 to 16 inches. The fish taught us that they wanted 360 Jigs tipped with minnow heads. On Lake Winnibigoshish: Unless you think this looks like fun, don't push your luck. For $10.00 and a slight detour to the either the South or North, these guys could have driven on and off of the ice safely. Photo courtesy Bill Donelly: Travel conditions allow ice fishermen to access spots that haven't been pressured this winter. Result = Good Fishing ! For me, larger jigs like this #6 Fat Boy tipped with 3 or 4 grubs attracted a lot more attention than smaller baits did. Bluegills were milling along the inner edge of a transitional flat the drops into deeper water. On the shallow side, a large weed bed, on the deep side a 20 foot hole. At 14 feet, these fish were well above the hole, but also a good distance from the shallow weeds. Fishing with Lindy's Tungsten Toads, the trick for getting a strike was in holding the baits nearly dead still. One quick move sent the fish running for cover. 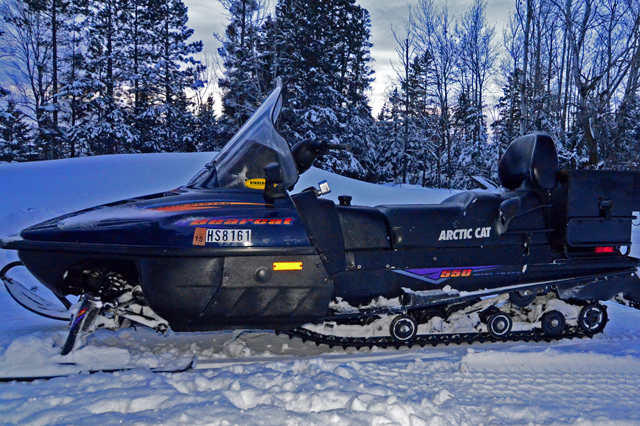 On Lake Winnibigoshish, snowmobiles will get you around. But you will be slowed down by the hard packed moguls that have formed by strong winds that drifted the snow cover. Danielson said; "Trying to move much faster than about 20 MPH is going to deliver you a bumpy ride out there". OH OH, Look what they did now. Lund has given us tiller boat fans even more to look at because they just introduced the 208 ProVGL Tiller. Curious about the 208 ProV Tiller? Let Al Lindner walk you through the whole rig. Devils Lake, which spreads across more than 220,000 acres in North Dakota’s prairie country, is legendary among ice anglers for its giant yellow perch. This week on Fish Ed, Jason Feldner stands in for Jon Thelen and brings you to Devils Lake North Dakota in search of giant jumbo perch. Jason shares presentation and location tips for early winter jumbos. Walleye Capital of the World, Lake of the Woods' fishing is very handy and very good in areas that are most accesible to fishermen. Anglers who vist Zippel Bay Resort can find everything they need at one stop. 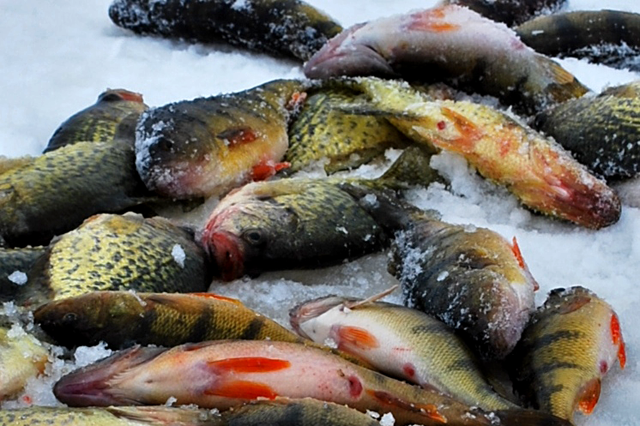 Read Article >> Ice Fishing Lake of the Woods . Photo: Trails End Resort Bowstring Lake: Promising News! Last weekend, as many as 9 inches of slush hampered travel in certain spots. But with the deep freeze that set in throughout this week, the lake is now creating fresh crust of ice, thickening daily. Trails End Resort . Photo: Trails End Resort: On Bowstring Lake, fish are cooperative. A productive mid-season fishing trip could be on tap for anglers who can gain access to fishing spots, Trails End Resort . Lindy's Foo Flyer (above) and Tungsten Toad (below) both turned in good performances. The original Toad, introduced a couple of seasons ago was already on the fast track to becoming my new, "old stand by". Now that it comes in Tungsten, the track is even faster! Waiting for the evening bite on Lake Pokegama. Ice conditions are good, with numerous pickup trucks on the lake and even some short stretches of plowed road. 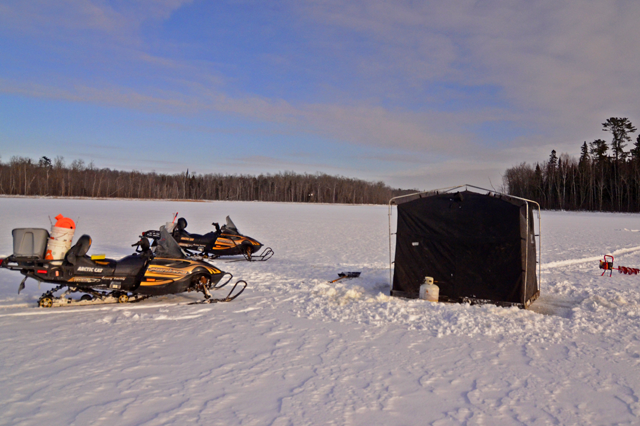 Ice fishermen with Snowmobiles and portable shelters are finding new opportunities every day. This small lake wasn't even walkable two weeks ago, now the machines are sitting high and dry. Jon Thelen travels to west-central Minnesota's lake Osakis in an ice fishing quest for crappie and bluegill. Jon shares tips and tricks to unlock this prime time panfish bite which is present on many Midwestern lakes throughout the ice season. This popular Deer River area has a half dozen permanent shelters, more portables and even a short stretch of plowed road. Finding a fishing spot here will be easy now. 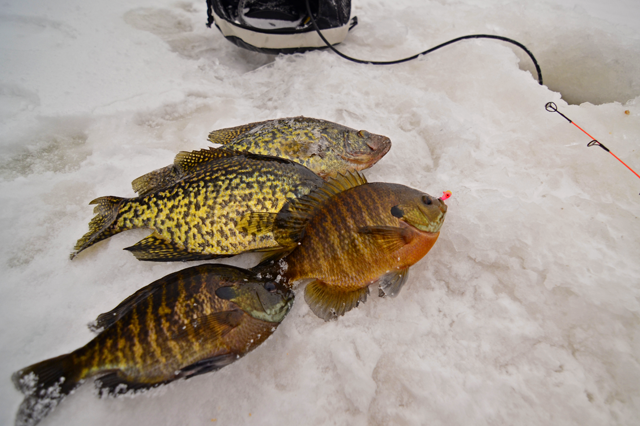 Photos Courtesy Eric Hutchins: Panfish anglers Chris Barton and Rob Sanders already found out; Ice conditions in the Grand Rapids area are improving steadily. On Monday, the ice fishing duo reported that Sunfish preferred Pink jigs tipped with Wax Worms. It was a real treat to feast my eyes on some fantastic ice conditions. This popular pan fish lake was a complete disaster just a couple of weeks ago. A full scale meltdown has transformed the surface into solid, snow free ice. Photo courtesy Greg Clusiau: Slabber! Ray Welle displays one of the several nice crappies that were caught last weekend on our trip to Big Bowstring Lake out of Geiger’s Trails End Resort. >> Read Story Bowstring Lake Crappie Fishing . On their way to a hockey tournament, Nate Thelen and Nate Amoe arrived early and spent a day on that other kind of ice. Good Idea! When there were Walleye lookers on the screen, they were subjected to a healthy dosage of persuasion. By gently wagging the rod tip, I could make the Foo Flyer move in a tiny arc and I think it appears to be a feeding minnow. Using this bait, I was able to convert about 7 out of 10 lookers, into biters.